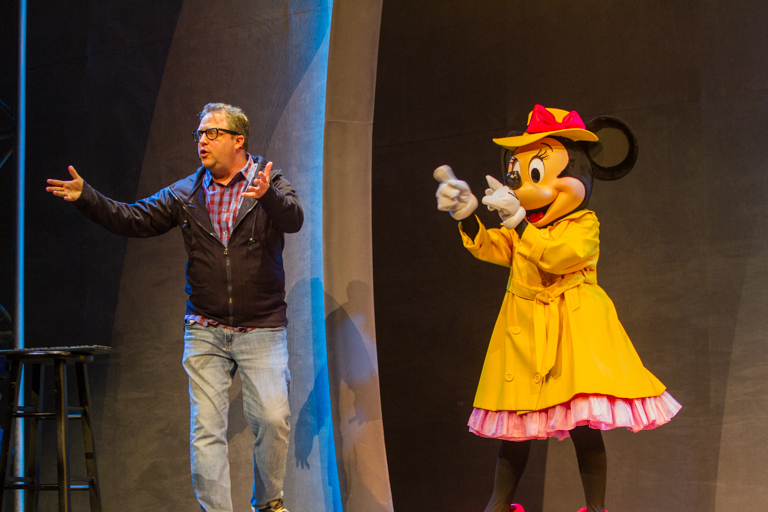 February means that Minnie's Moonlit Madness is back at the Disneyland Resort! 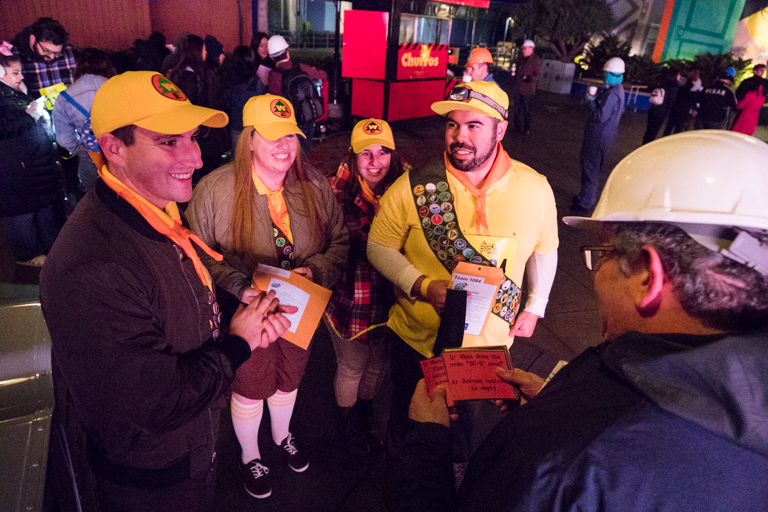 This after-hours scavenger hunt takes teams all through Disney California Adventure Park on a 2 hour quest for 1st place and eternal bragging rights. The event is bigger than ever! Past years have had in the 300s of teams and last year topped out at 404. This year there's going to be 468 teams! 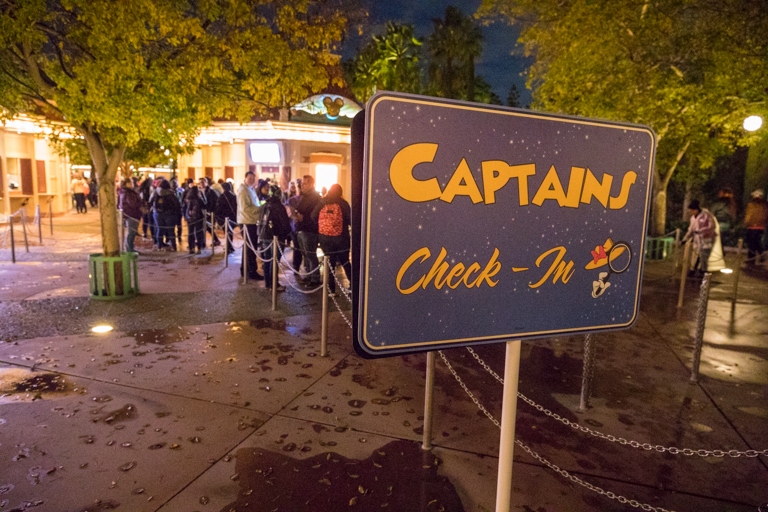 Captains can check in around 6:30 to get their welcome packet and wristbands for the team. 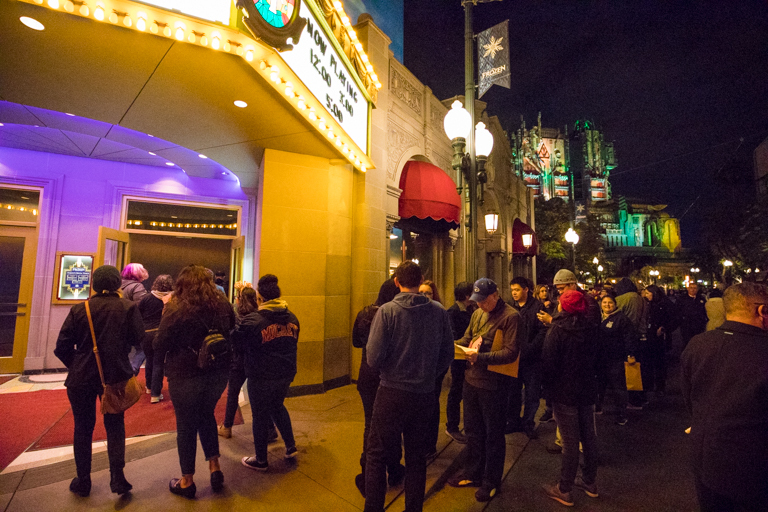 At 6:45pm teams could head into the courtyard of the Hyperion. This year there's a new twist on trivia. 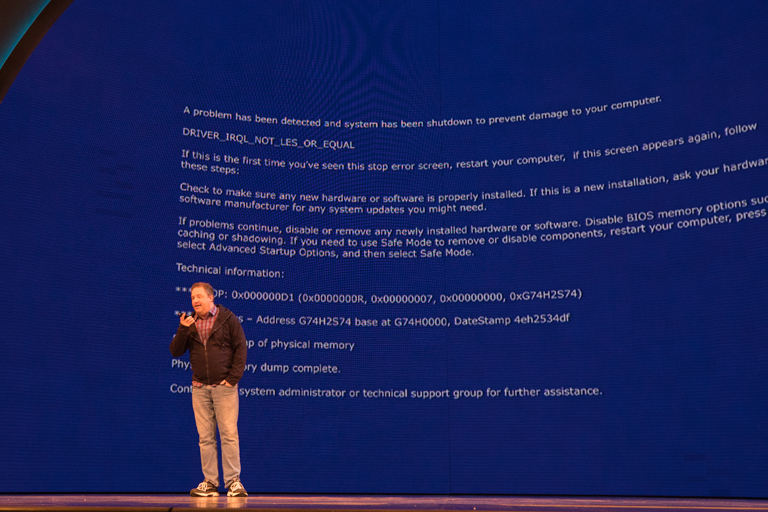 In past years, trivia has been inside the theater with questions flashing on the projection screen for about 30 seconds each. Teams would fill in their answers on a Scan-Tron sheet and pass them in after trivia was over. As more and more teams started using cellphones to look up answers, the clue writers started getting more and more obscure with the questions. Because of the format, as long as you took a photo of the clue, you could have multiple teammates working on different questions at the same time. Once they got the answer, you move on to the next question. All that is changing this year! 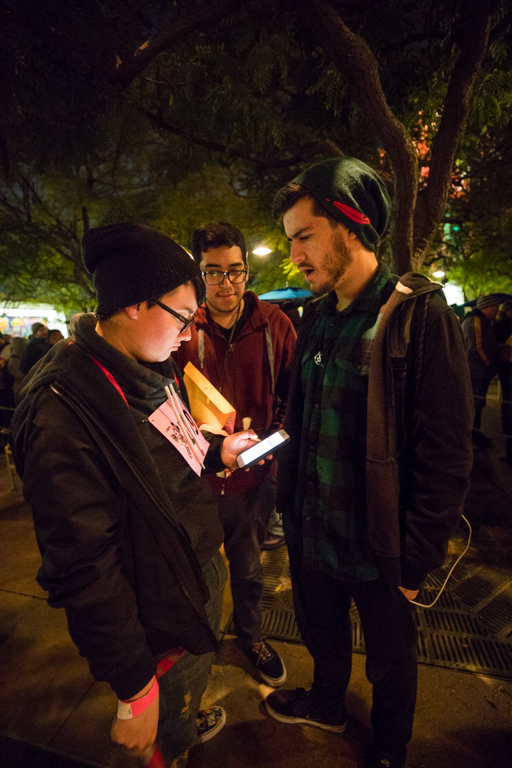 This year when they checked in, teams got a QR code that would open up a trivia webpage specific to them. 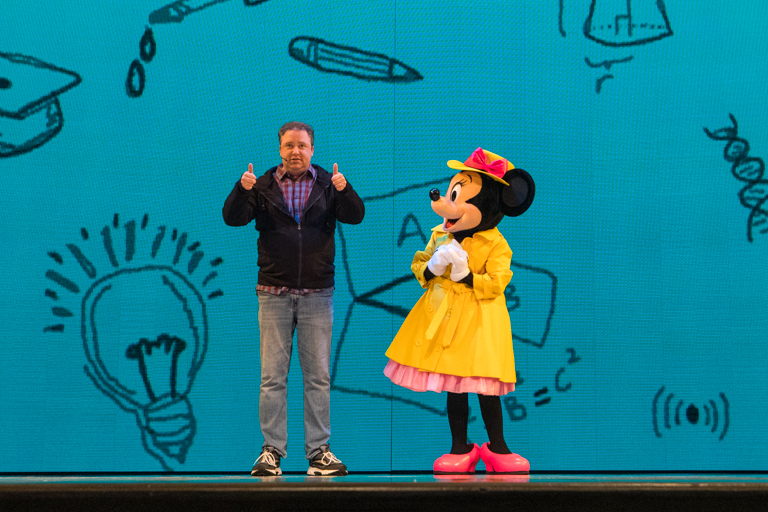 Minnie's is moving into the 21st century! Trivia is all on your phone now! That's certainly going to make scoring the trivia easier, but I know it was a bit more difficult logistically to pull off. One of the problems we've had during trivia was that everyone being on the network at the same time made everything slow to a crawl. Not to worry though. Signal boosters were in place so that everyone had a strong connection while they were doing trivia. And now that it's online, time limits for each question can be enforced. This year teams got 35 seconds for each clue, and if they didn't answer in that time, it automatically moved to the next question. There's no going back and answering old questions. There's barely enough time to have someone else with a phone look up answers. And as a result of the time limit, the Clue Crew went a little easier on the difficultly this year. Now Trivia is back to what you know about Disney versus what you can look up! From talking to teams afterwards, some were a little surprised by the time limit, but appreciated that the questions weren't so hard. One team I spoke to even thought they missed only 4! When we took 1st place last year, we only missed 7! While all the teams are getting their trivia on, Clue Crew members and their teams are getting prepped. 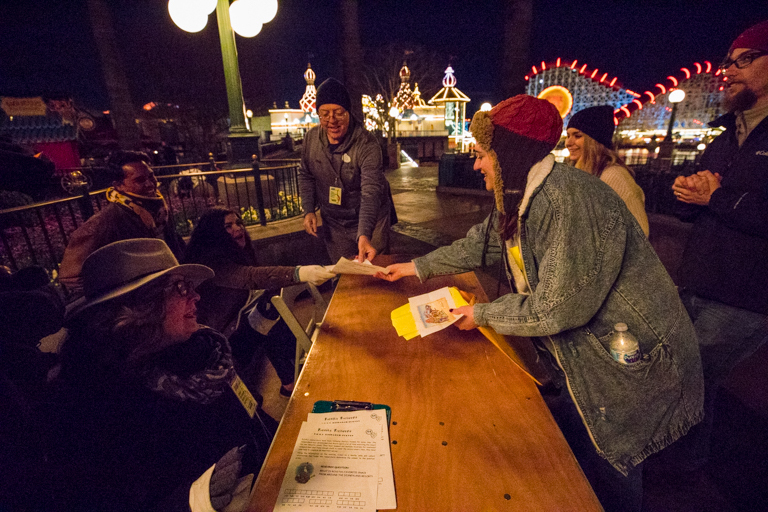 Final instructions are being handed out, along with more information about how many people will be coming through their clue tonight. Let's have a great night! Time to go to the Hyperion Theater and get this thing started. Uhh... That doesn't apply to me thank goodness. 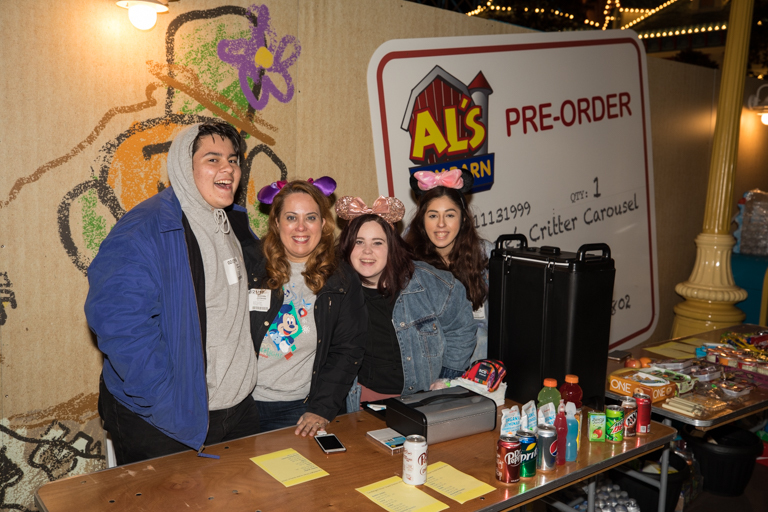 Every year a portion of the teams entry fee is donated to a charity/non-profit. 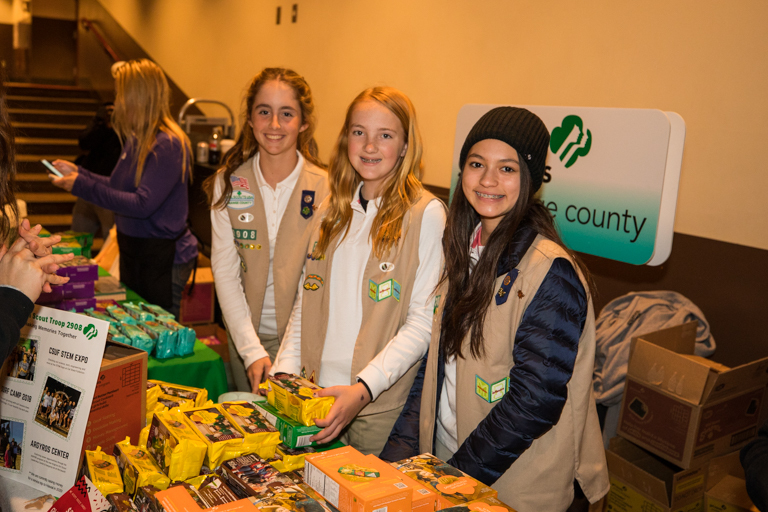 This year the Girl Scouts of Orange County has been chosen, and there's Girl Scouts in the lobby with a huge stack of cookies to sell. I saw more than a few teams carrying around boxes of cookies during the madness. 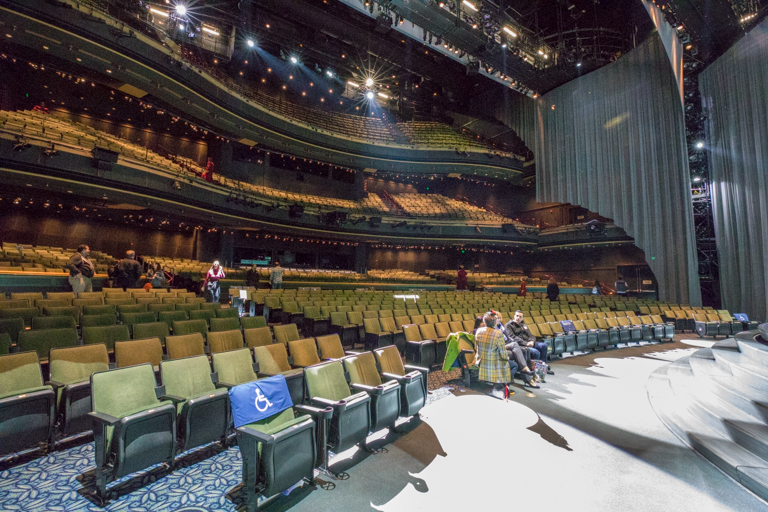 Inside everyone is finishing up the last rehearsal and making sure everything is ready to go. 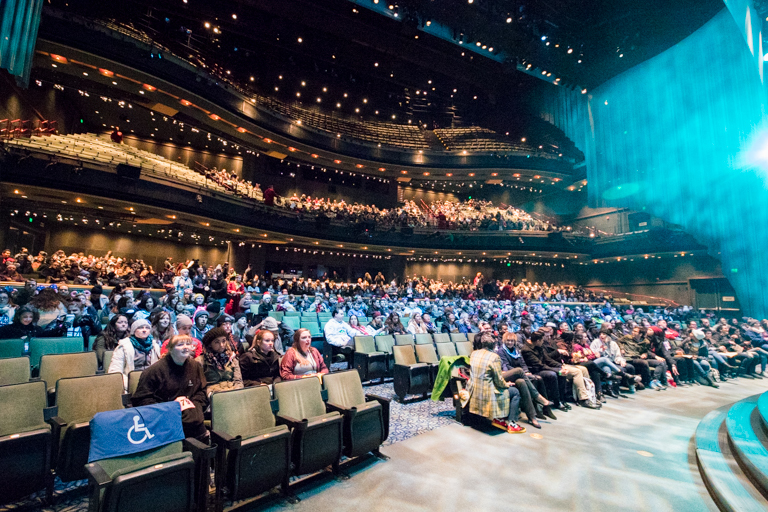 See that seat that's front and center and says "Reserved"! That's for me! Thanks William! That should be a great spot for photos tonight. Tonight there's at least two special guests here. 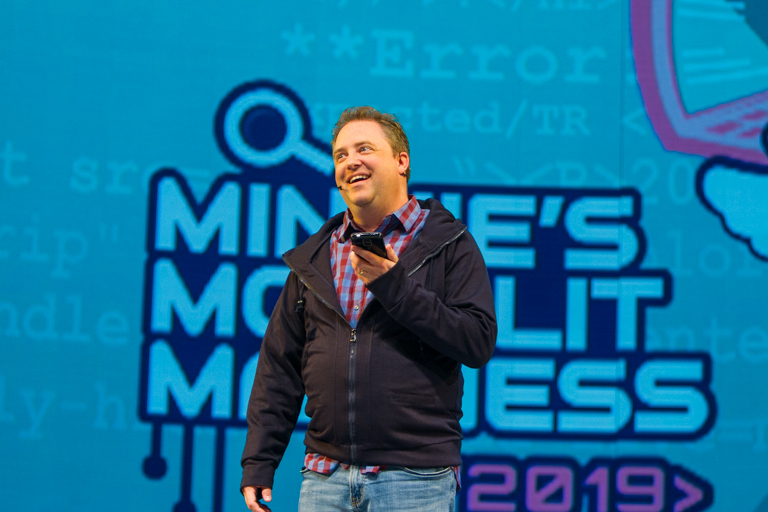 Dylan White has been our awesome host for the last 12 years. Now he's back again for lucky year number 13. Dylan performed as the Genie in Aladdin: A Musical Spectacular for 10 years before it was swapped out with the current Frozen show. These days he's doing comedy stand-up, voice-over and commercial work, and is the author of 7 books. Along with Dylan, there's another special guest. The Broadway version of Aladdin debuted in 2014. Courtney Reed is the original Broadway Jasmine, performing 8 shows a week for 4 years! Now she's in LA, but she's still a member of the Broadway Princess Party. Courtney is here thanks in large part to Craig. She's going to help out with one of his clues tonight. We'll see her a little later. And I've got to get a picture too. She was so nice. 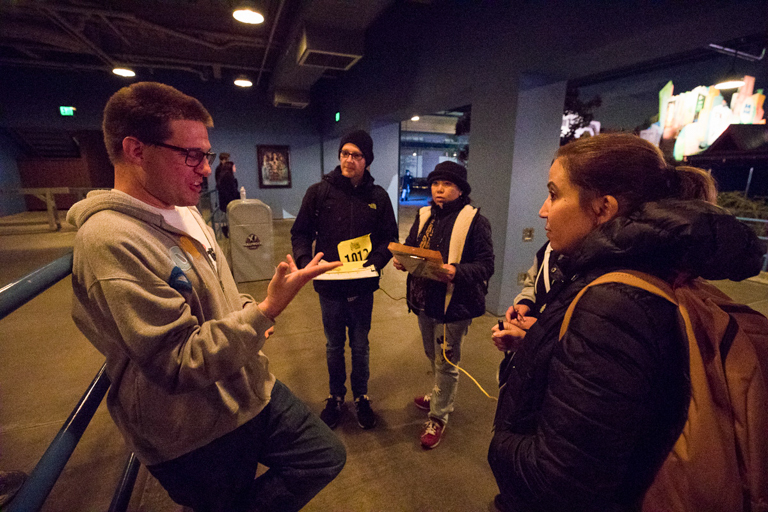 While we were waiting for the teams to be let in, I got to chat with lots of people involved with tonight. Like Sofia Ouhri who did the graphic design for tonight's theme. It was really cool to see the art on things like beanies, jackets, and official Disney pins. 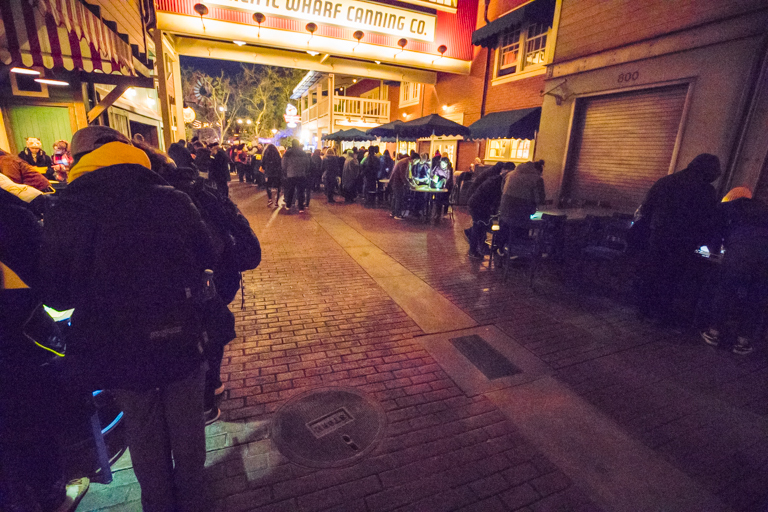 I chatted with Rob from the Disneyland Line (Disney's internal cast newsletter) who was there taking photos of the event for that, and the official event photographer Christopher. As you maybe can tell from the logo, tonight's theme is all about computers and coding. 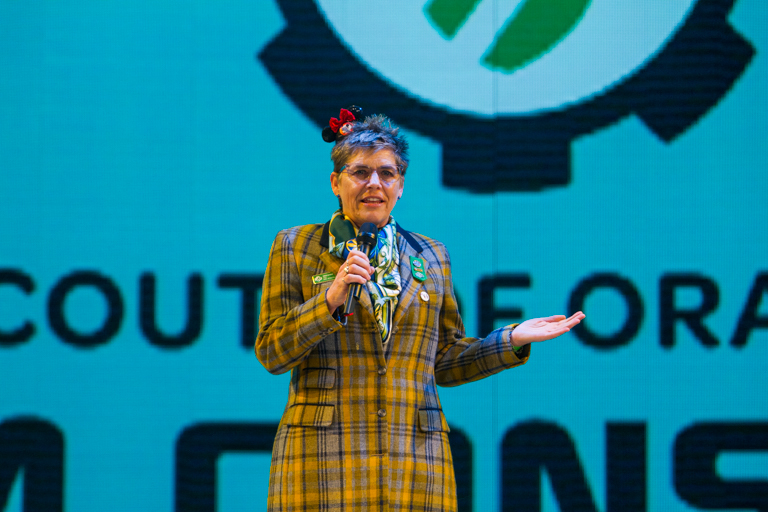 The Girl Scouts of Orange County really push STEM so they're a great fit. 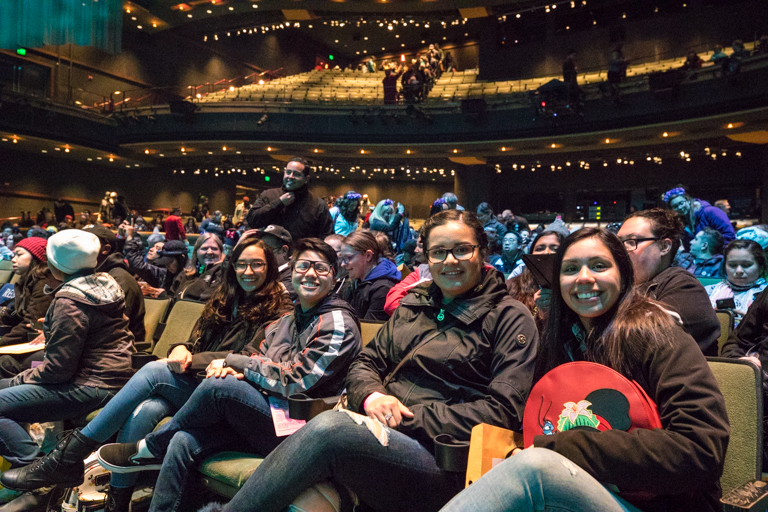 Around 8:15 all the teams were let into the theater. I told you earlier that there are more teams than ever this year, but I didn't tell you how that was going to be accommodated. Instead of having one start time for all 400+ teams, there's two start times. The first group will start a little after 9pm and go through 11pm. 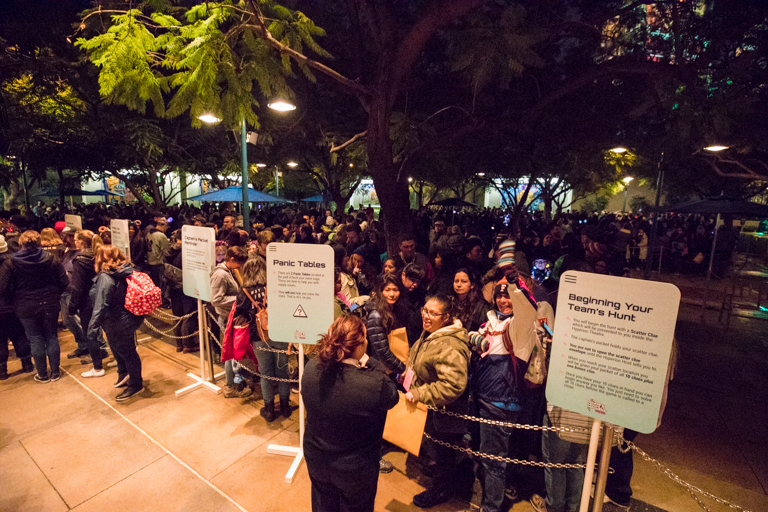 A second group will start a little after 10pm and go until midnight! That's 3 hours of clues for everyone working the event tonight, and it's going to be extra busy for that 1 hour where both teams overlap. While we waited for the event to start, I chatted with a few teams. New teams who are experiencing this for the very first time. And returning teams who love coming back year after year. I even recognized a familiar face in the crowd. 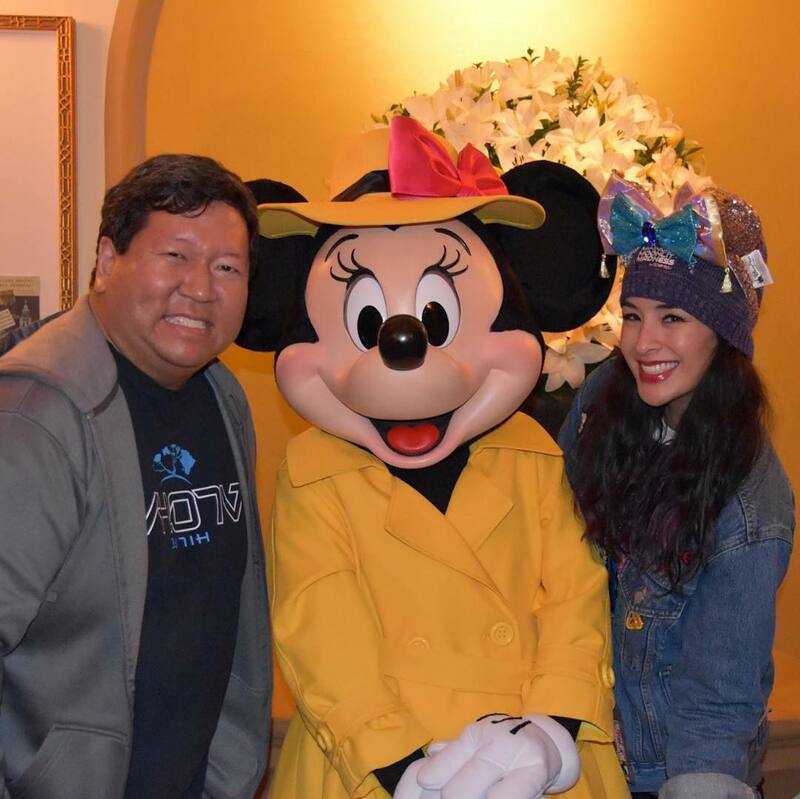 Sarah Sterling is a Disney blogger and I've watched quite a few of her YouTube videos, including a few that prepped us for our trip to the Asia Disneylands. 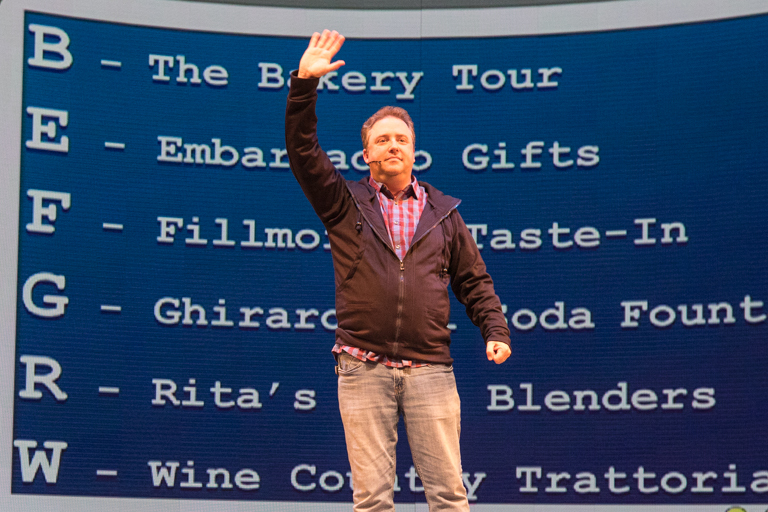 Right around 8:30pm our host for the evening Dylan White comes out on stage! 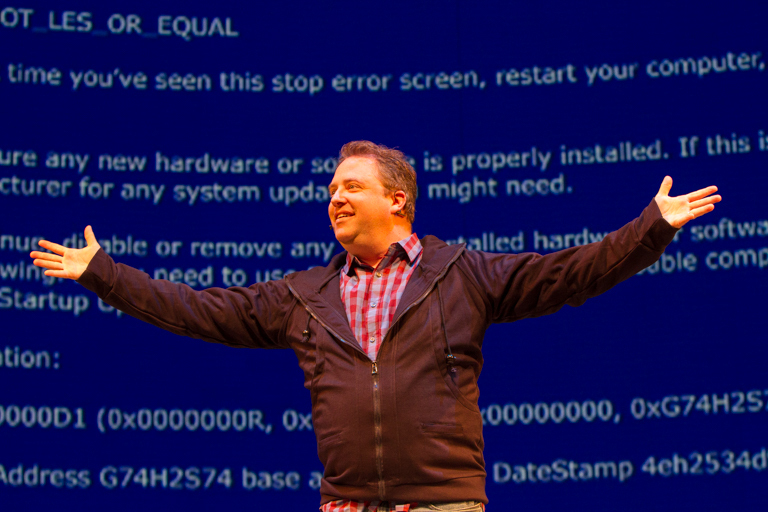 And blue screen of death. Oops. Dylan got out his phone and called into the Disney IT help desk. That's unfortunate timing. 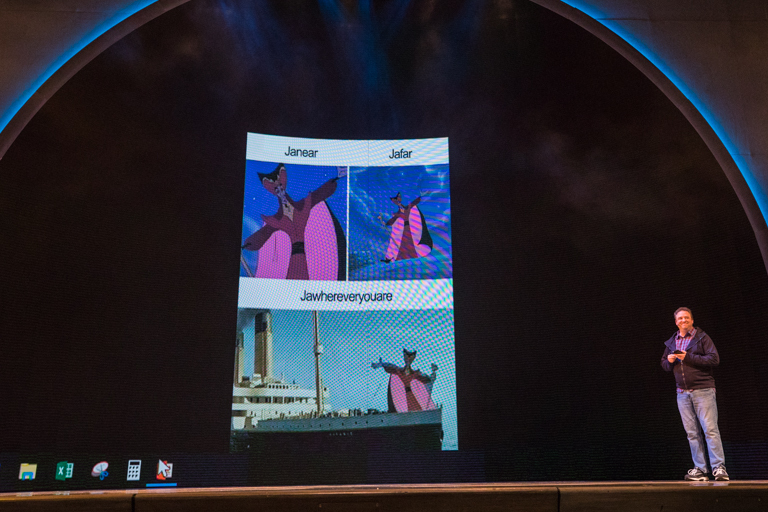 Thankfully cast member Felix was able to log in to Dylan's computer, pull up his desktop and get the presentation started again. Nice background picture Dylan. Dylan - So Felix, do you have any idea what might have happened? Felix - Oh yes. It was Ralph. He broke the internet. Dylan - Ah, of course. Well I'm very glad you were able to Fix-It Felix. Let's try that again. 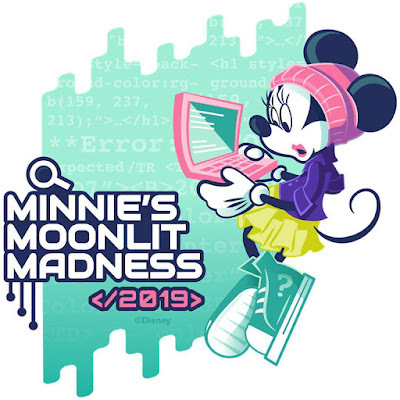 Welcome to Minnie's Moonlit Madness 2019! 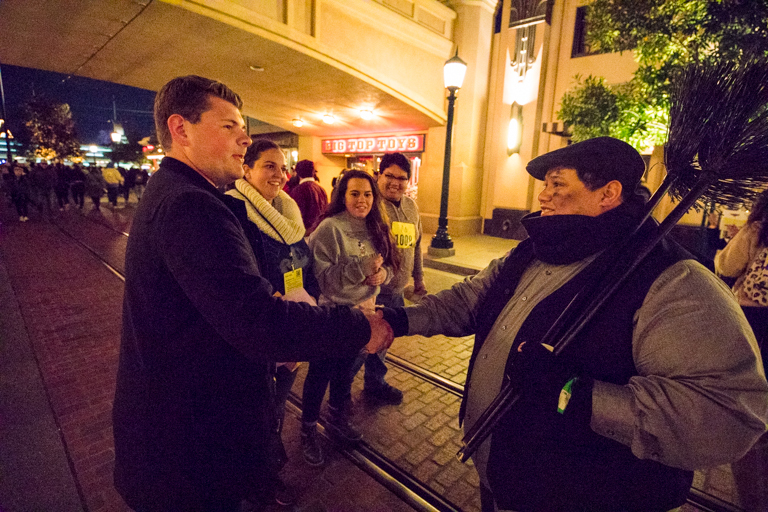 To tell us more about the organization our entry fees our supporting, we welcomed Disneyland Ambassador Rafa Barron. 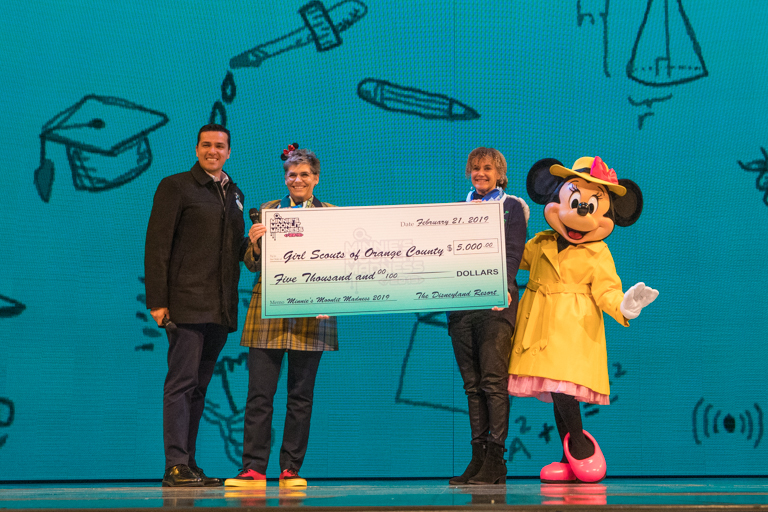 He brought Vicki Shepp, CEO of the Girl Scouts Orange County, out to the stage. 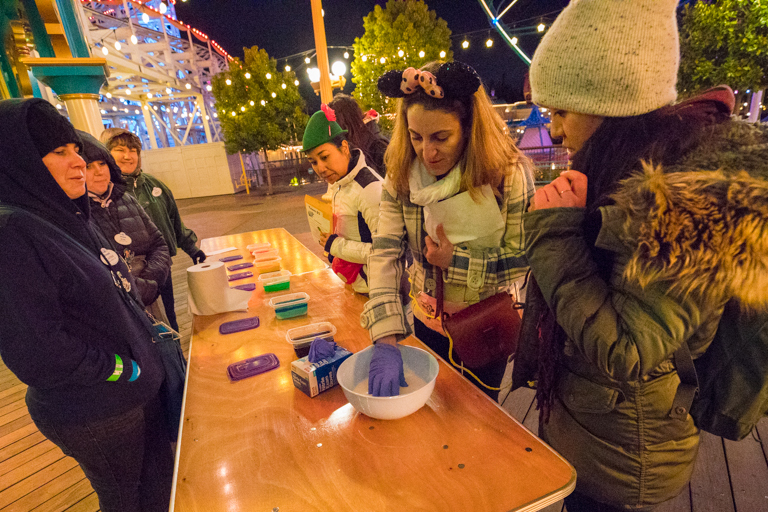 The donations tonight will help the nearly 30,000 members in a variety of STEM activities, be it coding, building robots, or citizen scientists. 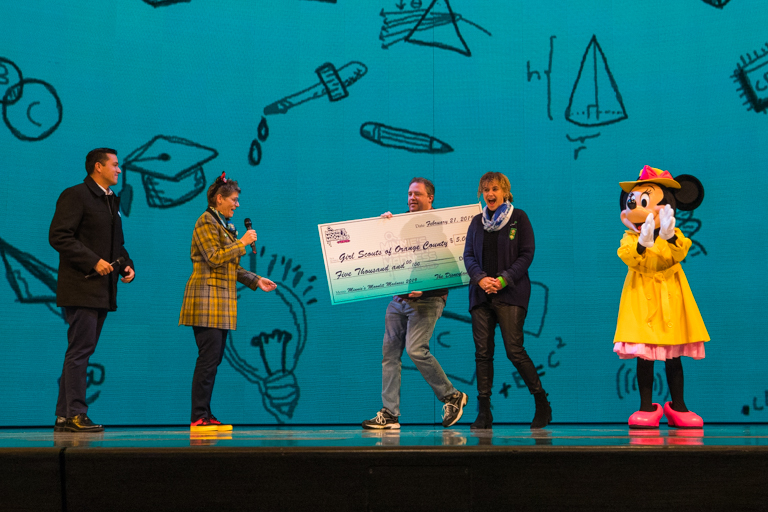 Dylan came out on stage with a giant check for $5000. After a quick pose, they wished everyone luck with the madness tonight and they were off. Next Dylan was back and he launched into his monologue. Whatever the theme of the evening is, he comes up with a good 5-6 minutes of material. Tonight's theme being computers he had plenty of groaners related to that. Dylan - My wife was a server. She used to work in a coffee shop, and she was working on a screenplay at the same time. I guess you could call it a Java Script. 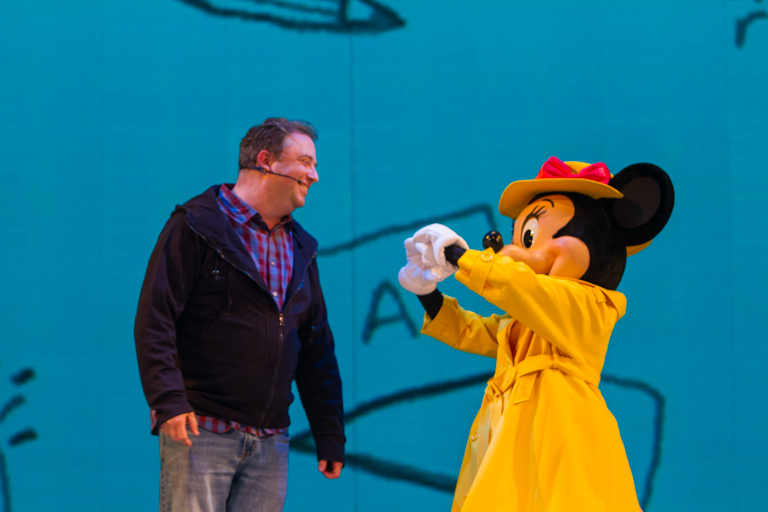 Minnie never likes his jokes. 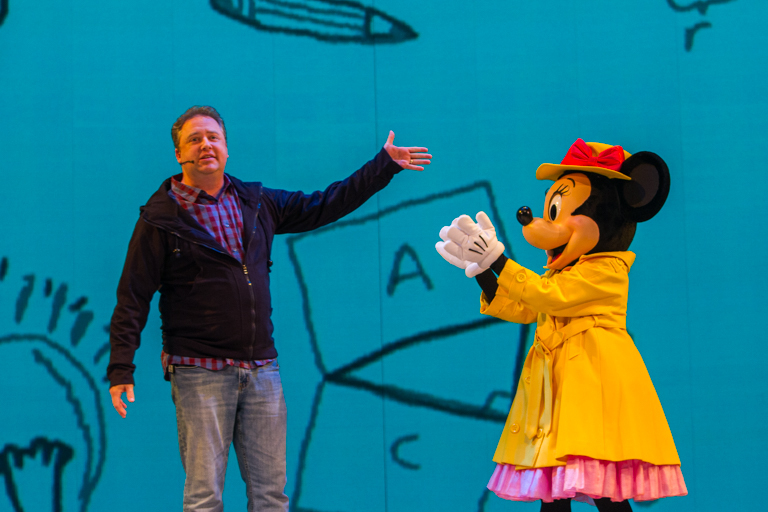 Thank Minnie. 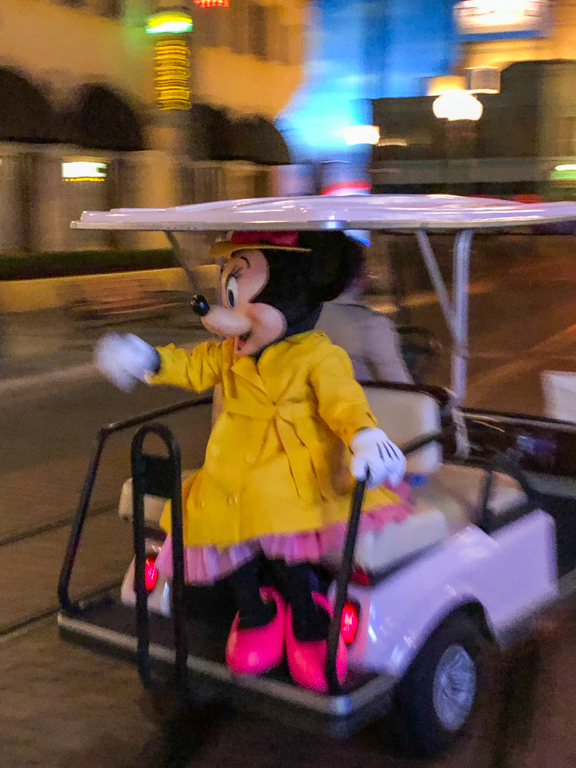 Ladies and Gentlemen, Detective Minnie Mouse! Making a heart sign to Dylan. 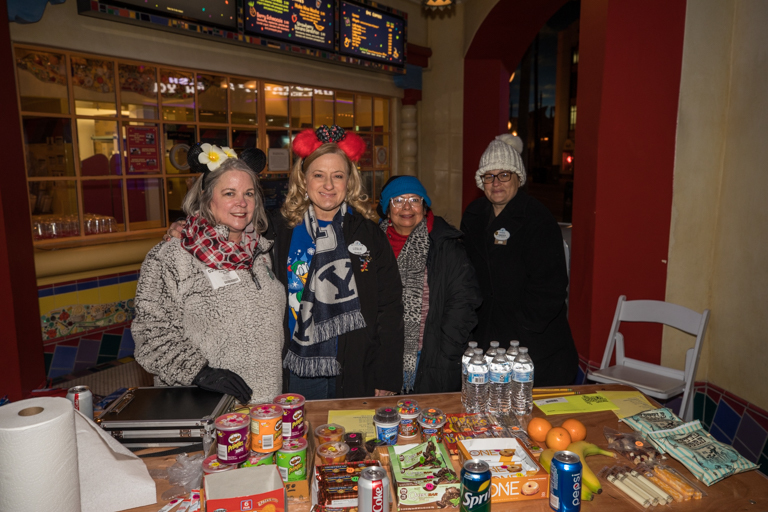 Before we continue, we need to give a very big thank you to the members of the 2019 Clue Crew. 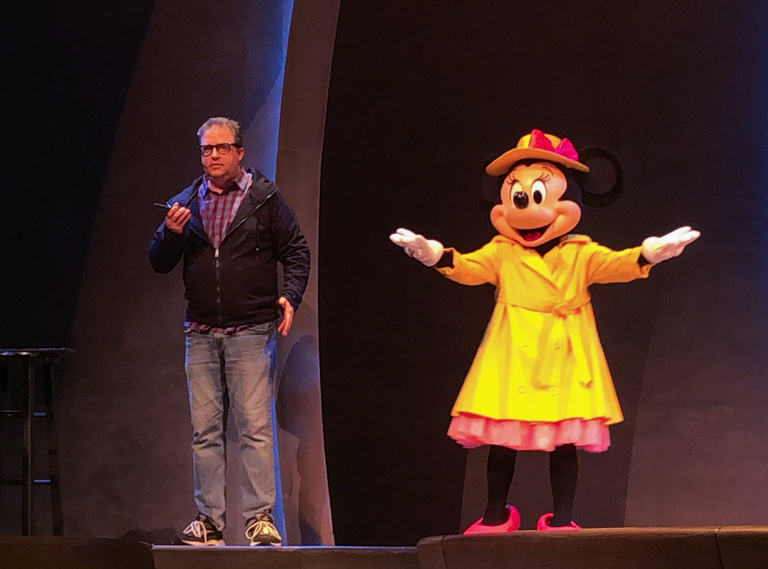 I think the years represent how long they've been working Minnie's Moonlit Madness. 2010 - Genessy, 2011 - Craig, 2012 - Grant/Wendy, 2013 - Britt, 2015 - Maggie, 2016 - Thomas/William, 2017 - Sally, 2018 - Christine/Andy/David/Michael, 2019 - Bethany/Katie/Michael/Shon. Thanks everyone! Next it was time for the teams to take off into the parks. Dylan tried to use his keyboard to log in and type his password, but many of the keyboard keys are missing. If only there was someone who could help. Wait! You guys can help! Go into the park and find those keys. 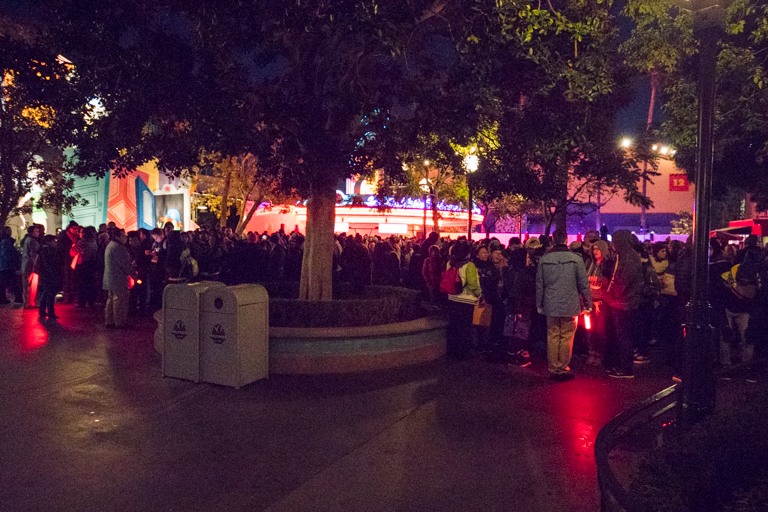 Everyone emptied out the side door towards Monster's Inc. 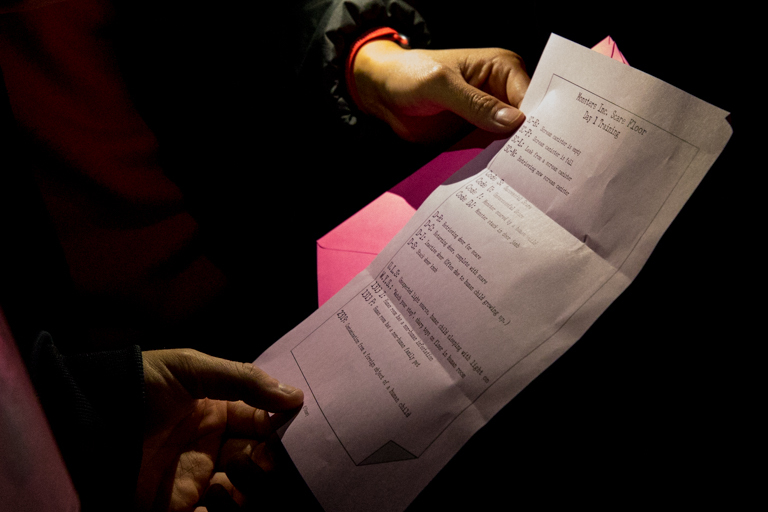 Using the letter on their scatter clue envelope, they could figure out where to head to figure out the password. 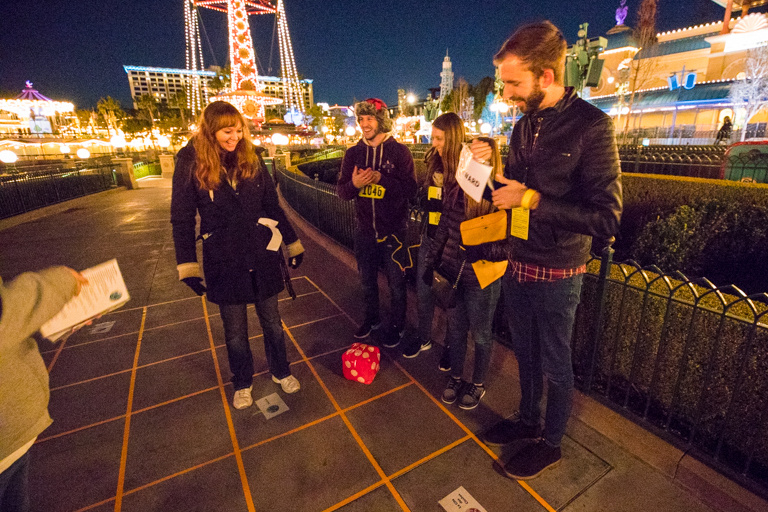 The point of the scatter clue of course is to break those 400 teams up and get everyone spread throughout the park. While all the teams were making their way out of the theater, Dylan came down off the stage and we got to talk for a few minutes. Nice work on the monologue. That was a ton of computer references to squeeze in there. He said it was a lot more difficult this year than others. Past years of Broadway puns or 80s references were a lot easier to write for. Every year I try to get video of everything with varying levels of success. I've already got 2 DLSRs going at the same time (one with a normal lens, the second with a zoom lens) and trying to do video at the same time is hard. Normally I'll wrap a gorilla pod around my knee and take video from there. Using a GoPro hasn't worked too well. This year, I'm using a point and shoot video camera with zoom and a bigger sensor. I was very thankful for the team sitting beside me. Seeing my predicament, Cast Member John from Team 22 offered to hold the video camera for me. Thank you! You can see the entire intro, check presentation, Dylan's monologue, and scatter clue here. 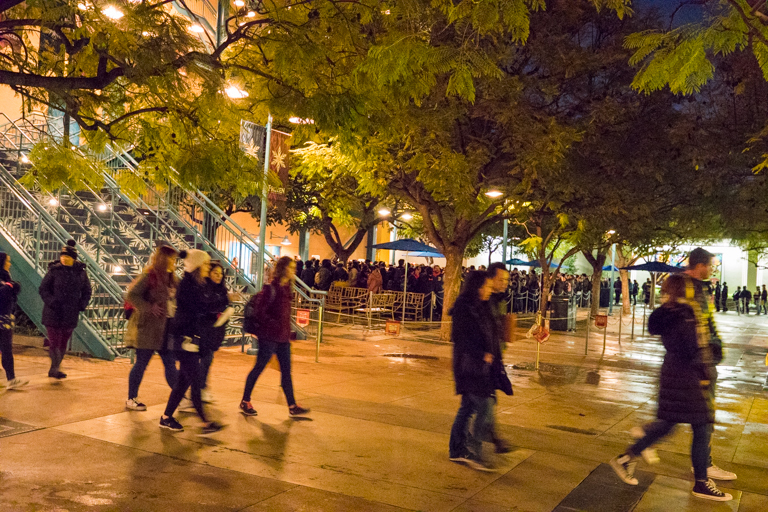 Outside, the theater teams were lined up and ready to go. 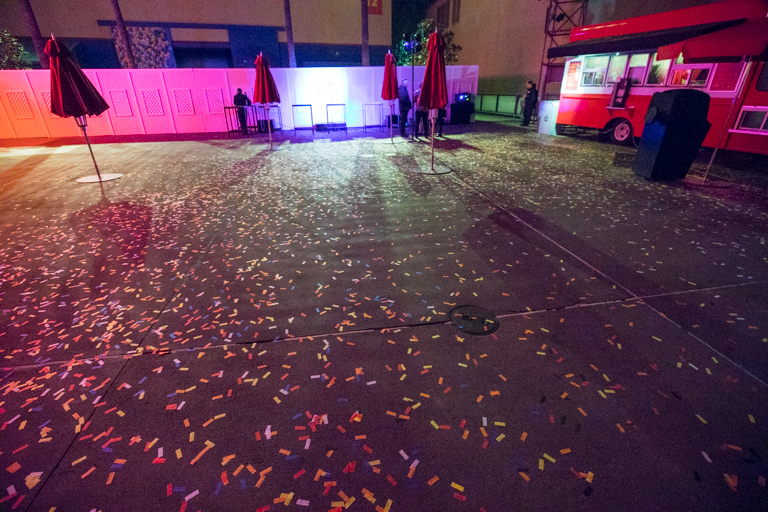 A voice came over the loud speakers and with a shower of confetti teams were off! 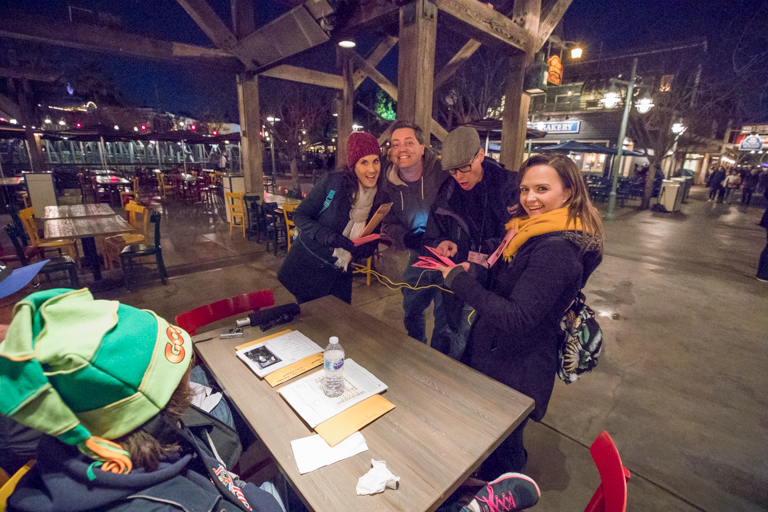 Teams went to the scatter clue location, found the sign with the password, and wrote that on their envelope. 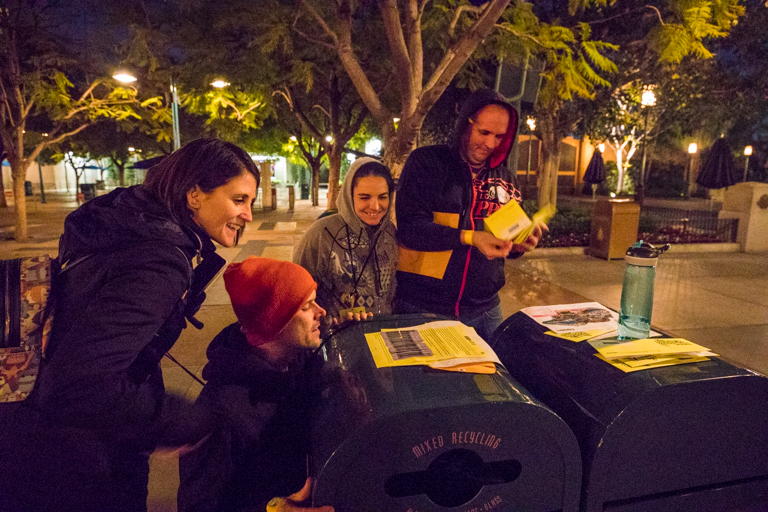 From there, they also found a VoluntEAR and received their 10 Clue Envelopes. Yep, that's another big change from years past. Remember how there used to be one location in the park called Clue Central, and after you solved every clue you had to return there to get your next one? It was always a madhouse as 400 teams of 4 who were each tied together, tried to move around 1 location. 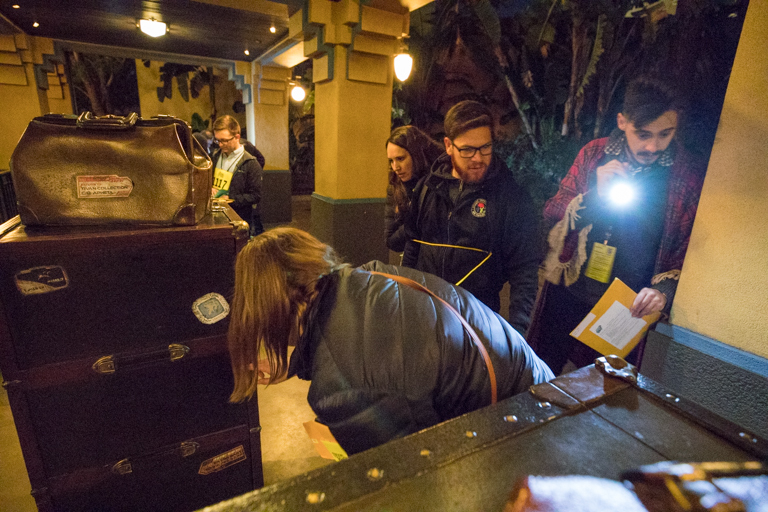 Having to return for each clue meant it was difficult when you had to walk across the park to solve a question and then return to get your next clue. I think my entire team remembers the shin-splints that came from trying to speed-walk in sync (no running) to a location, solve a clue, and get back to Clue Central in ~9 minutes. If you're going to solve all 10 clues (plus the bonus and scatter clue) you have to average 9 minutes per clue. So all that has changed this year. 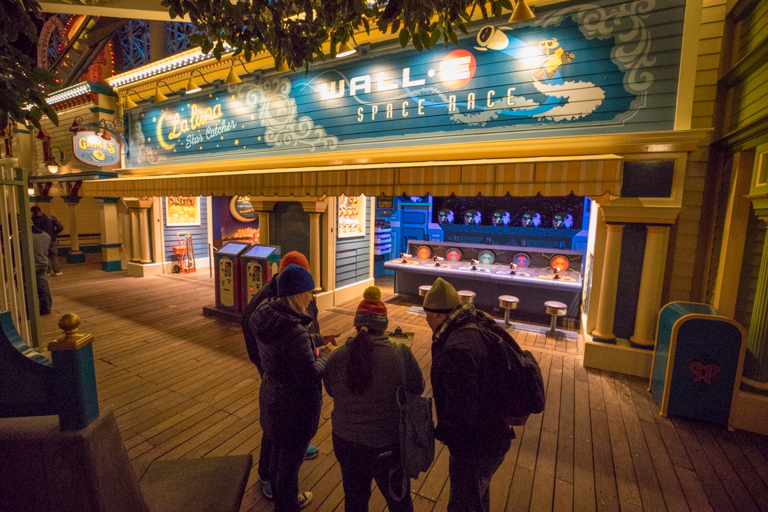 Since teams get all 10 clues at one time, there is no need for Clue Central and as such there is no major choke point in the park anymore. 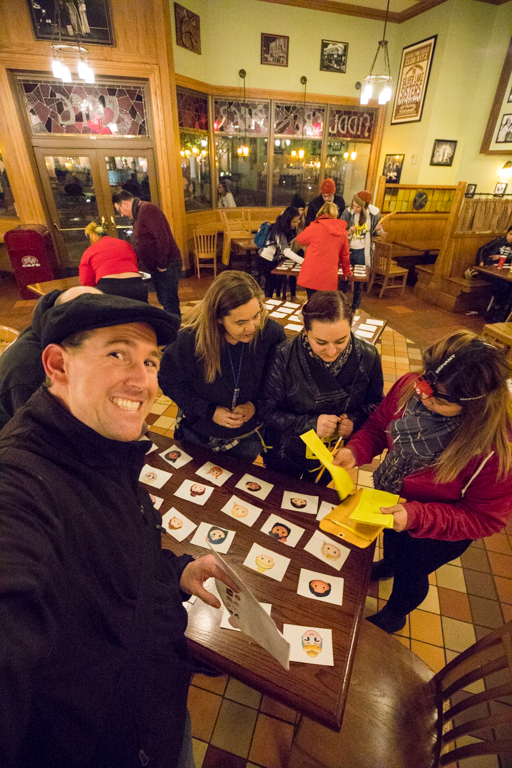 I saw many teams doing what I would have done; open all 10 clues and plan out a route. Don't criss-cross the park if you don't have to. Clues generally come in one of two styles. There are clues that require you to go to a specific location in the park and perform some action (be it observational, physical, etc). There are also logic style clues that don't require you to go anywhere. You can solve them anywhere. All the tables around the Scatter Clue were filled with teams divvying up clues, having one or two people work on the logic problem clues, while the team walked over to the location specific places. Doing so meant you could be solving 2 or 3 clues at the same time! A definite time saver! Let's go see some of the clues! 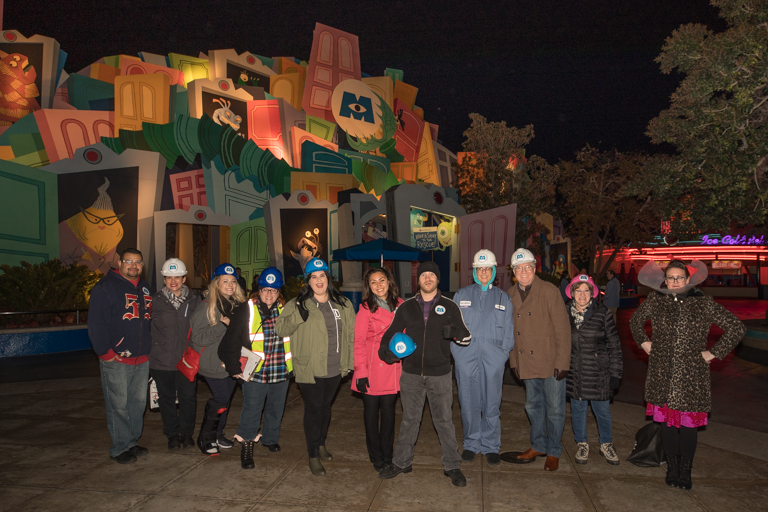 Over by Monsters, Inc. Mike & Sulley to the Rescue!, there's a whole bunch of people in hard hats. Turns out we're training some new recruits. It's Day 1 on the Scare Floor and all new recruits are required to memorize the Scare Floor Codes. There's 17 codes total. 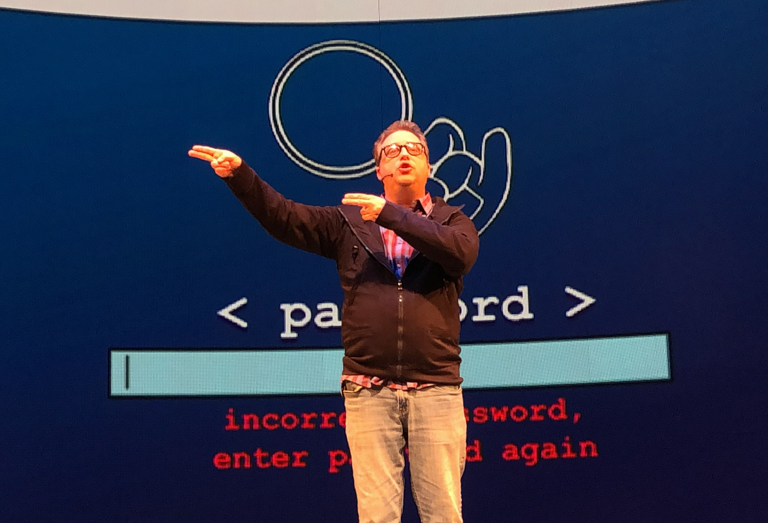 Things like Code-S: Successful Scare, Code U: Unsuccessful Scare, D-R: Retrieving Door for Scare, U.L.S. : Unexpected Light Source, and of course the always popular 2319: Contamination from a foreign object of a human child. 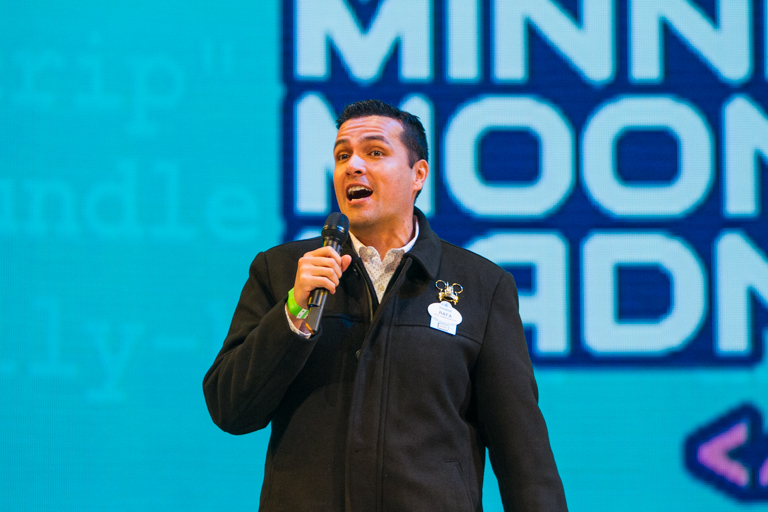 Teams were then quizzed on their codes. Teams that got 9 answers correct passed their training and got to move on. Teams that were unsuccessful had to go back and study up a little further. 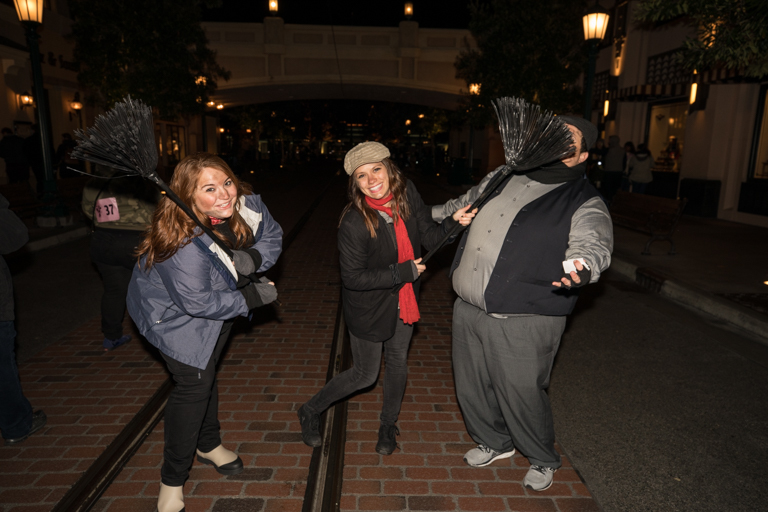 Over on Buena Vista Street another clue was happening. 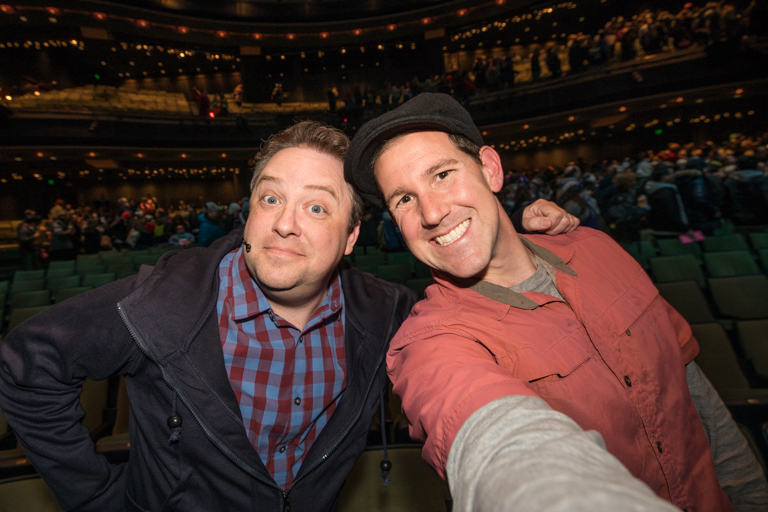 Are these Newsies? Not this year. 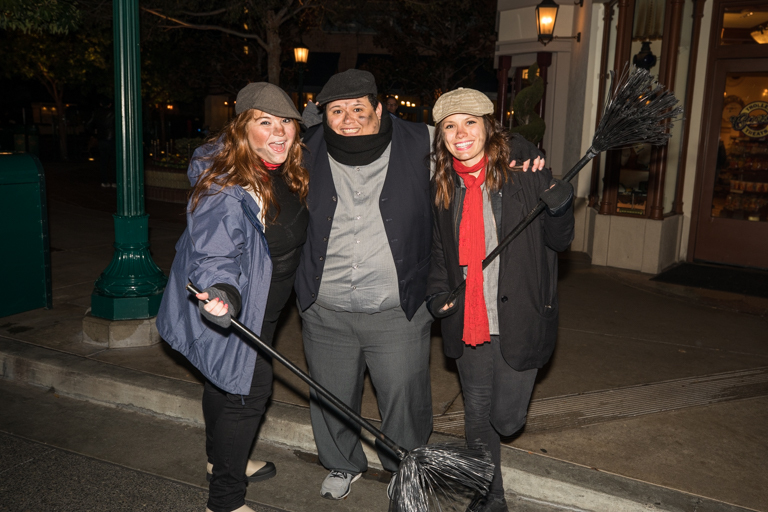 This year there's a band of chimney sweeps from Mary Poppins running around. 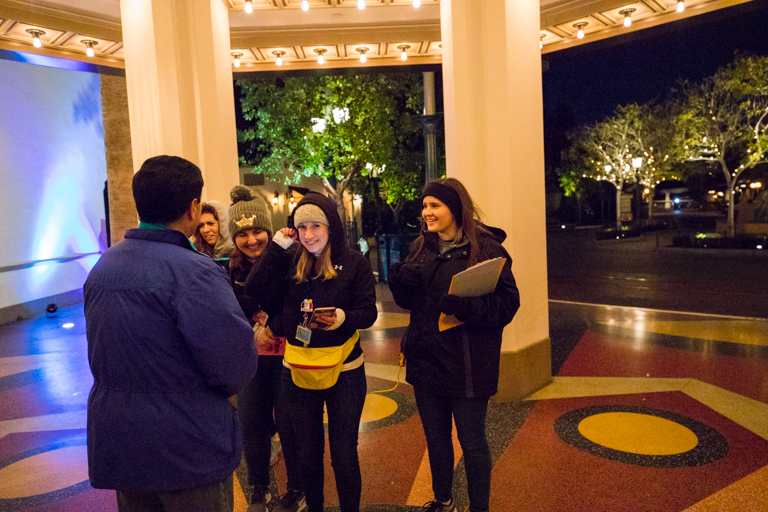 Teams were required to spot details up and down Buena Vista Street, like the names on a set of mailboxes, or the maker of a particular clock. Using those answers, they pieced together a puzzle that asked them to "Greet a chimney sweep and have good luck rub off on you." If you remember the words from the song, Chim Chim Cher-ee, you know that "A sweep is as lucky as lucky can be. Chim chiminey chim chiminey chim chim cher-oo. Good luck will rub off when I shakes hands with you." Teams that got that far were given a final question "How many Oscars were Mary Poppins and Mary Poppins Returns nominated for?" and wrote the answer on their envelope. 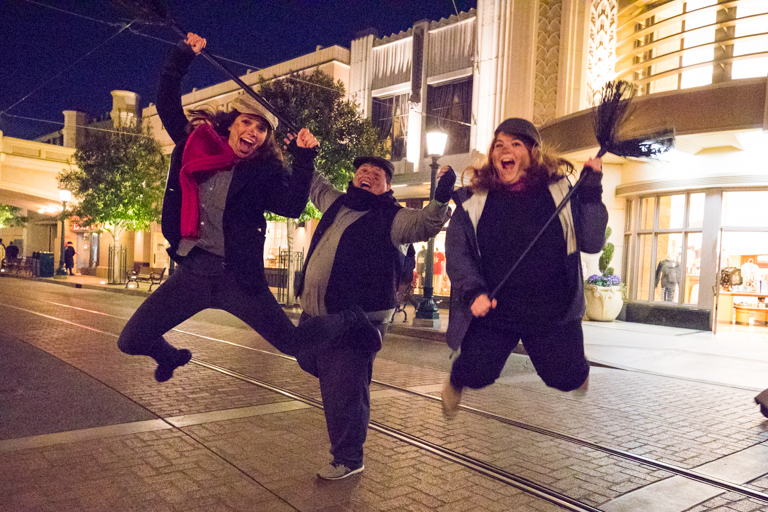 The sweeps had fun with the night, but weren't all that busy. A little dancin, some broom races. All good times. 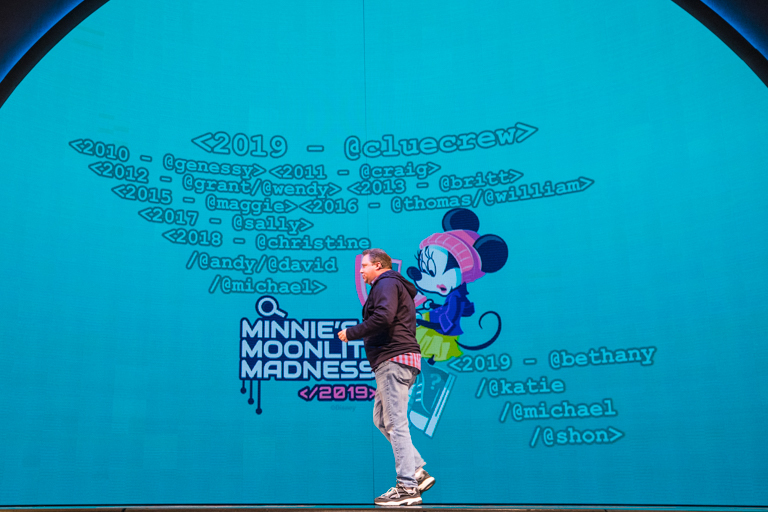 In front of playhouse Disney there was something going on that seemed like MadLibs that teams seemed to be having fun with. Lots of teams had found placed to hunker down and start working through clues. As I was wandering the park, I was amazed at how empty it seemed. Getting rid of Clue Central and getting rid of that choke-point cleared the walkways. For this clue, on your sheet you had characters from Pixar movies. Next you had slips of paper with actors on one side and long skinny lines on the other. Once you matched up the actors with the characters they voiced, you had the lines in the right order. Then, if you looked at the lines from an extreme angle, it revealed they were words. Solve the question "Which actor has appeared in every Pixar movie release?" and you had your answer. I've shown an example of the puzzle below. Look at it from an extreme angle from the top or bottom. Closing one eye also helps. There's team 22. Thanks for the help recording earlier guys! Good luck tonight! 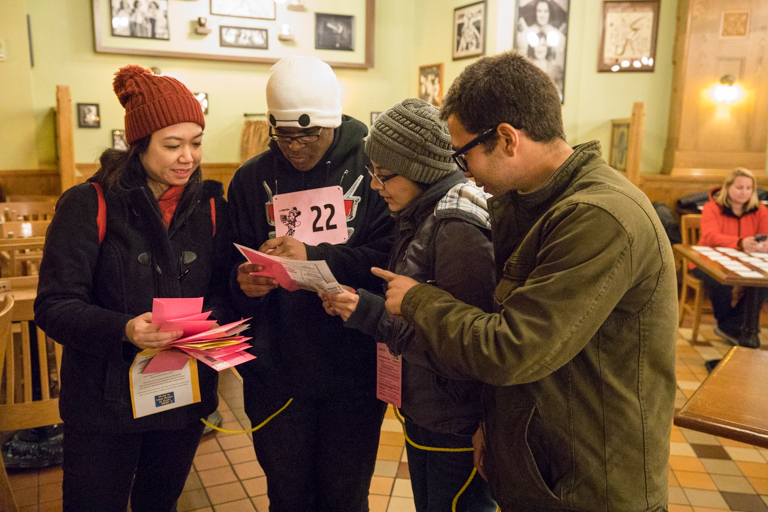 At our next stop, inside the Fiddler Fifer and Practical Pig Cafe, teams had to play a game of memory. This game is just a little different though. 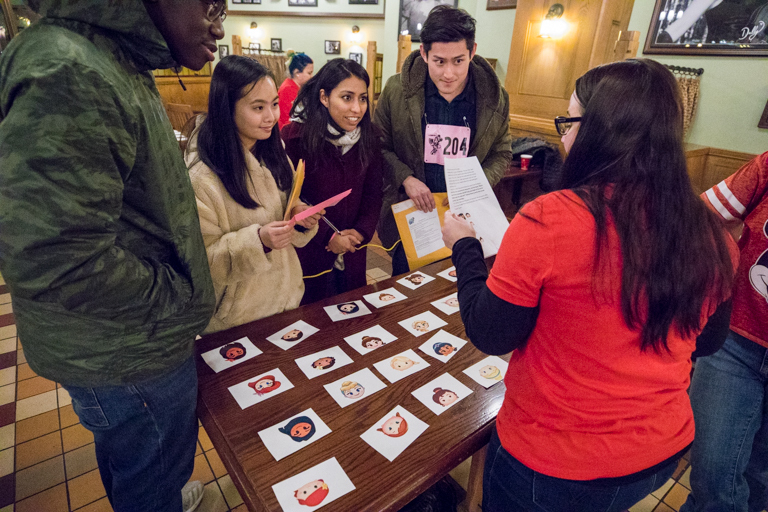 Instead of having an exact match, teams were trying to match up characters from two different Disney Mobile games: Disney Tsum Tsum and Disney Emoji Blitz. With 24 cards to solve this clue was giving some teams some problems. Once all the cards were turned over, teams had to answer an additional question. 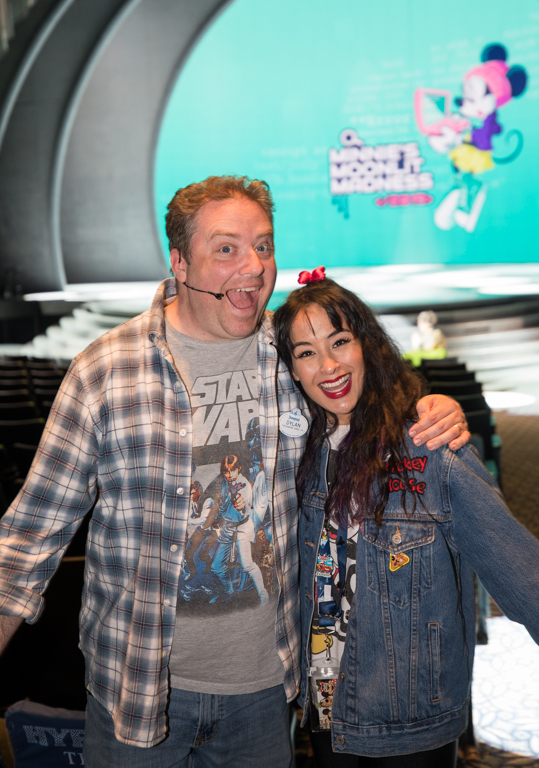 "In the movie Ralph Breaks the Internet, all of these characters helped Ralph at the end, except for 2. Write the names of those two on your clue envelope." My role as volunteer tonight is pretty loosely defined. 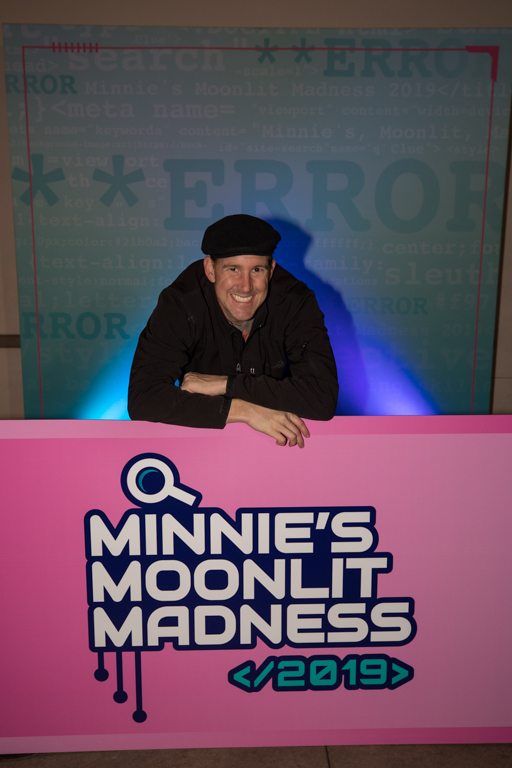 I'm acting as the unofficial photographer and documenter of all things Minnie's Moonlit Madness. 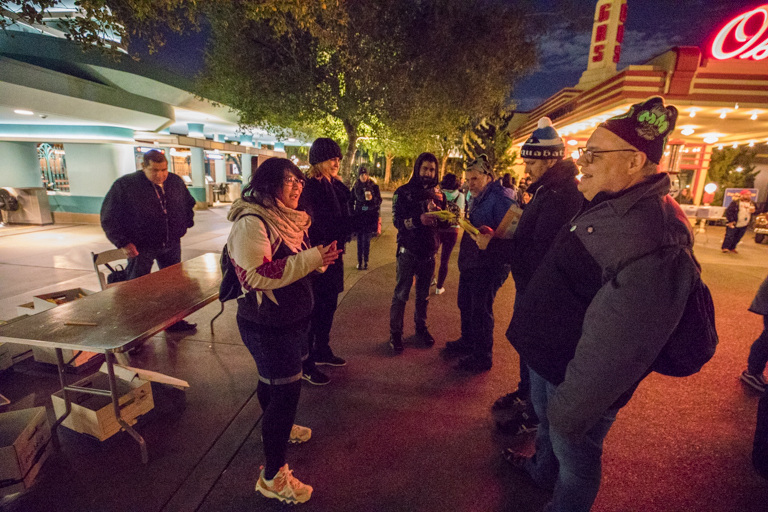 As such, I'm talking with teams and clue writers, wandering the parks taking photos and videos, and just trying to record the night. That doesn't mean I can't help out some times too. Around 11:20pm this clue was getting slammed. 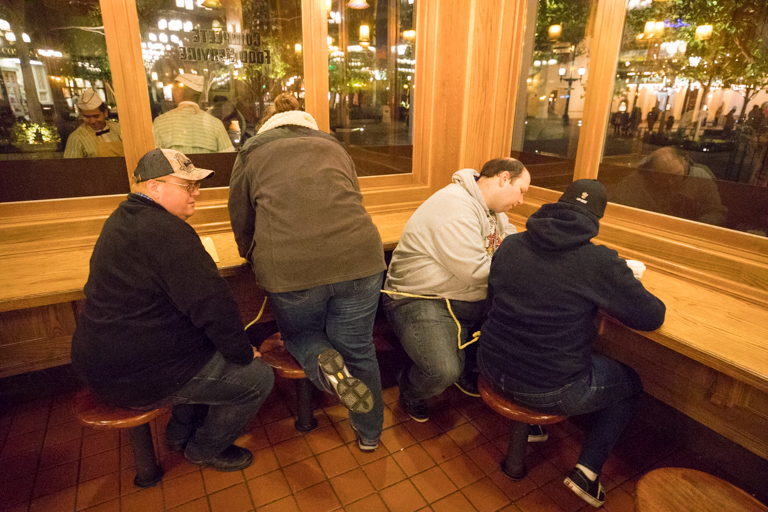 Lots of teams were working the clue, but there were still a couple in line waiting. I can help! I was actually already familiar with everything, so I was able to jump right in. After working through 4 teams, the rush was over and Clue Captain Dave was okay with me taking off. 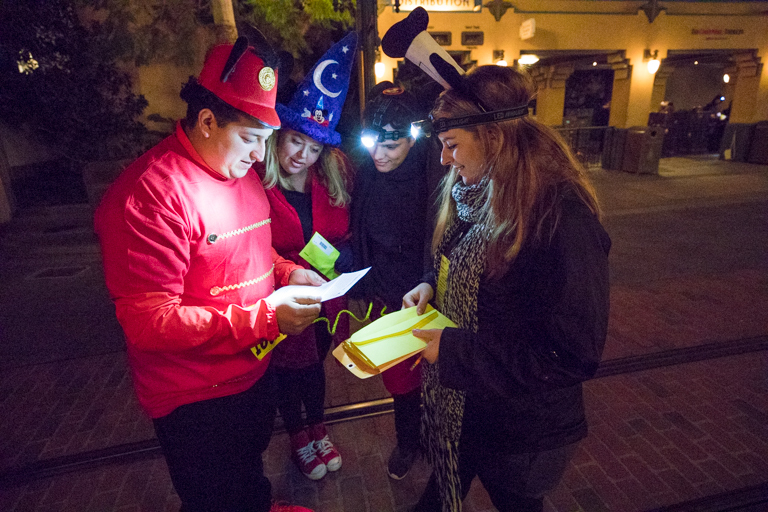 Right next door at the Smokejumpers Grill, Clue Crew member Sally put together a really fun clue. I hope you know your Disney movie details because some of these will make you think. 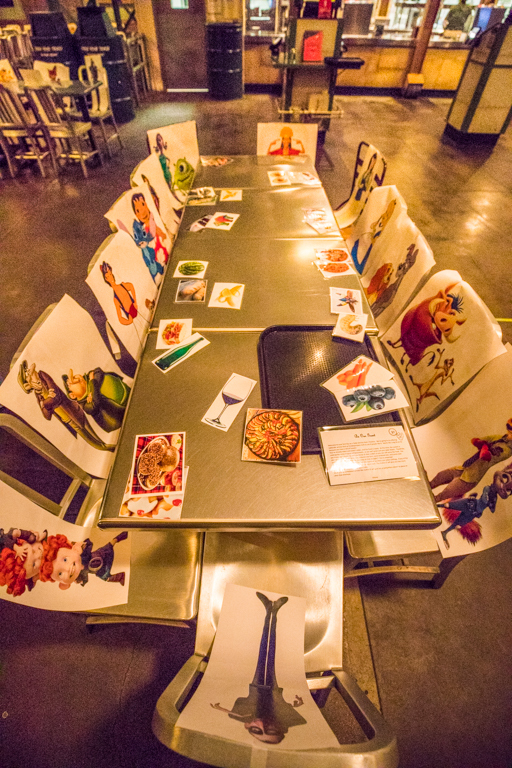 All the seating inside Smokejumpers was pulled into these dining parties with lots of Disney characters. Your job as the waiter was to figure out what everyone had ordered. No teams were doing this clue when I arrived so they let me try solving it myself. You had a tray with 27 different food items. Each diner might have 1, 2, or 3 different foods. Some of the easier ones: Lady and Tramp - spaghetti noodles and meatballs, Timon and Pumba - grubs and insects, Anton Ego - ratatouille and a glass of wine. Some of the more difficult ones: Horace and Jasper - a ham sandwich and bottle of alcohol, Mulan - porridge, bacon, and eggs. The one that made me laugh: Moana and Hei Hei - A rock. I thought this was a really clever clue. Outside, teams are learning to send Semaphore text to their teammates. They'd get the name of a Disney character and spell out their name. Team members typically were able to guess the correct answer after 2 or 3 letters. Get 8 names right and you're moving on. 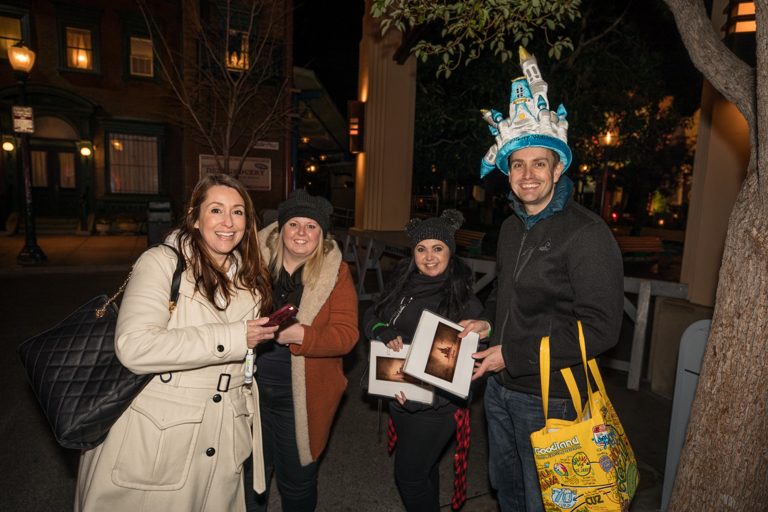 For clue 15, teams had photos of casual wear that princesses might wear (inspired by Ralph Breaks the Internet) which led them to the Instagram page for the Broadway Princess Party. 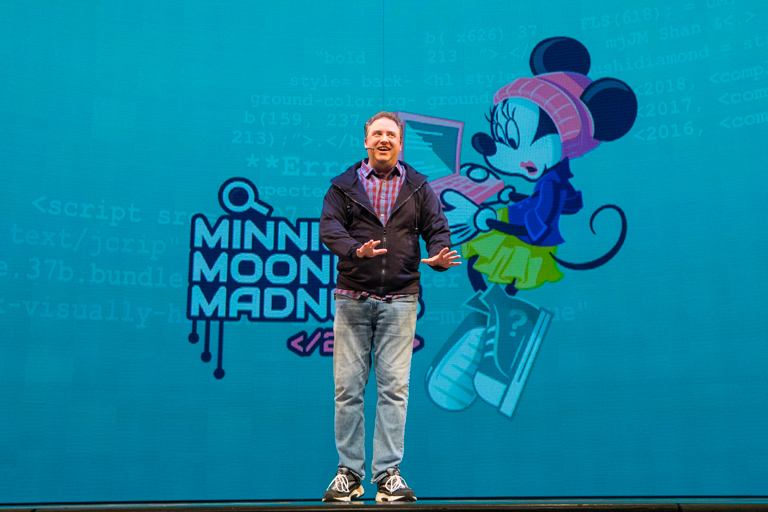 Craig had coordinated with them to record a special video just for Minnie's Moonlit Madness. 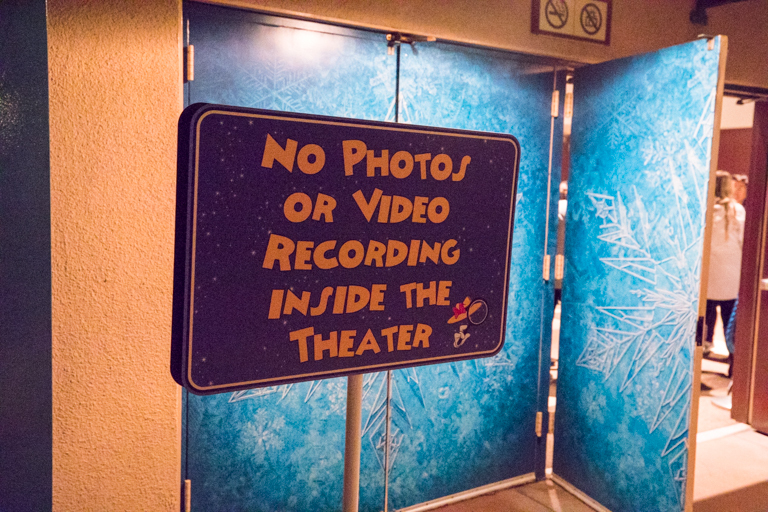 The video pointed teams to the location that pays tribute to where Snow White made her debut. 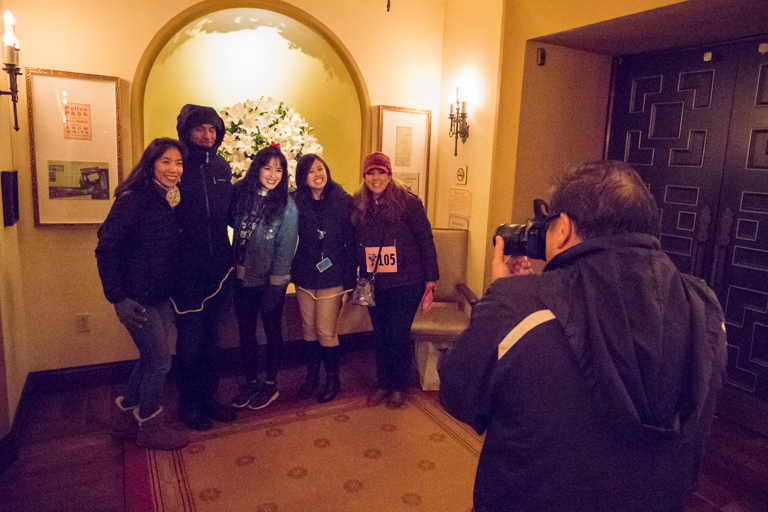 Teams found their way over to the Carthay Circle Restaurant where a very special surprise was waiting for them. 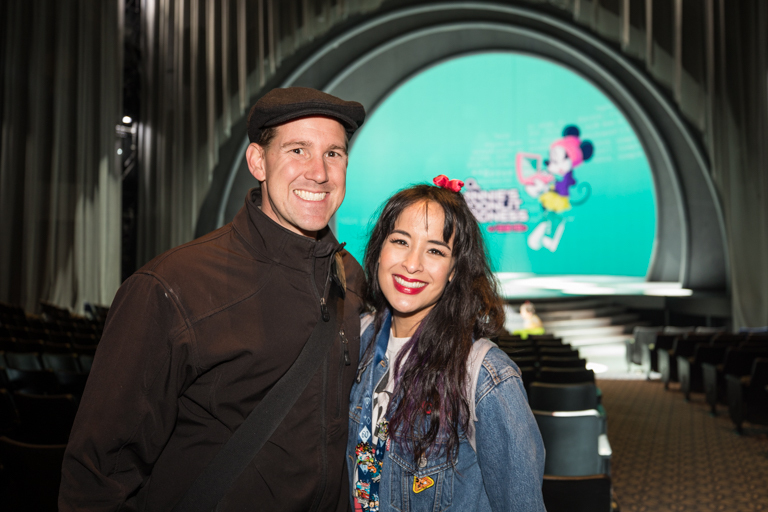 Courtney Reed, the original Broadway Princess Jasmine was waiting for them and posing for pictures. Quite a few teams were excited to see her. 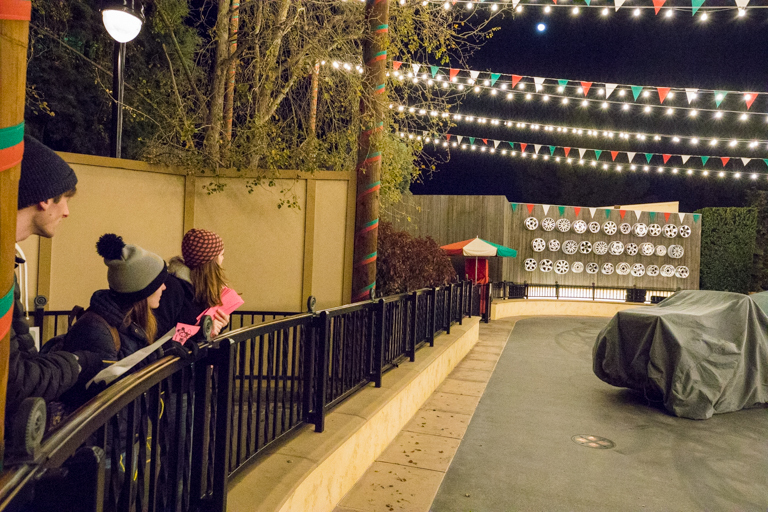 Let's head over to Cars Land. 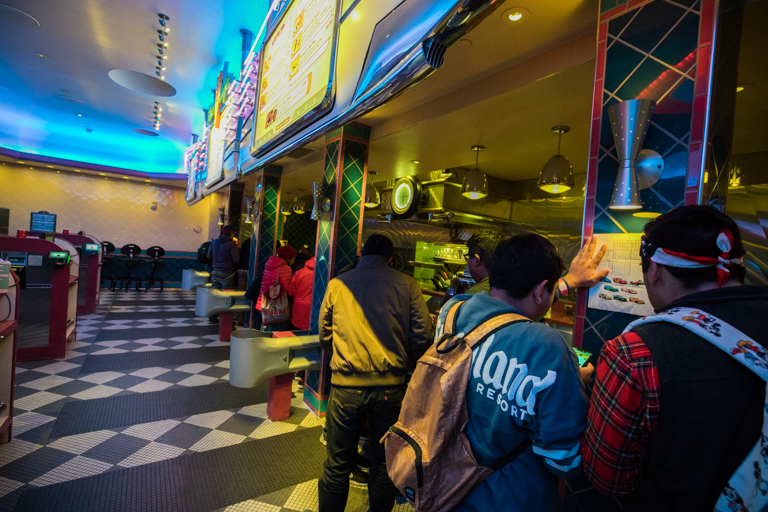 Inside Flo's V8 Café teams are using the tracks on the jukebox to unscramble a puzzle. The tire rims at Luigi's are perfect for a puzzle. Teams here had to treat the rims like a keyboard, and using photos of the rims were required to decode a puzzle. The only difficulty is that there's duplicates of the same rim. It was a clever puzzle and in the end teams might have left with a little bit of a smile on their faces. 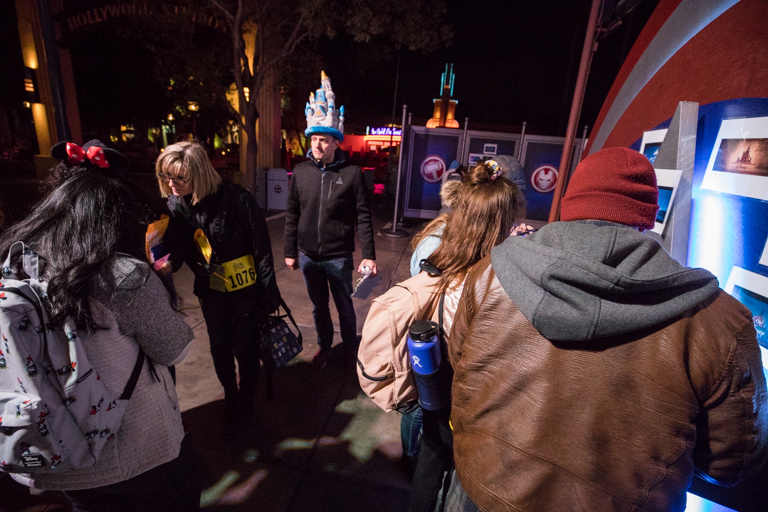 Back in Cars Land, teams were wandering the streets looking for information to solve another clue. 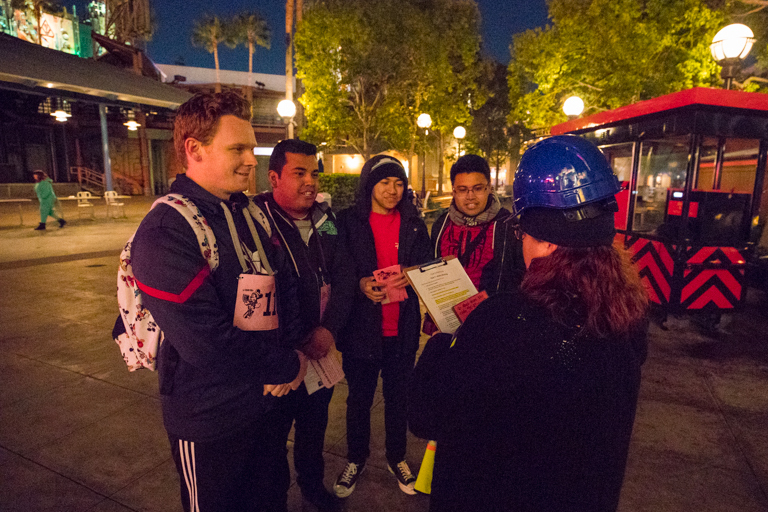 At Cocina Cucamonga teams worked a clue that used American Sign Language. This was another fun puzzle. 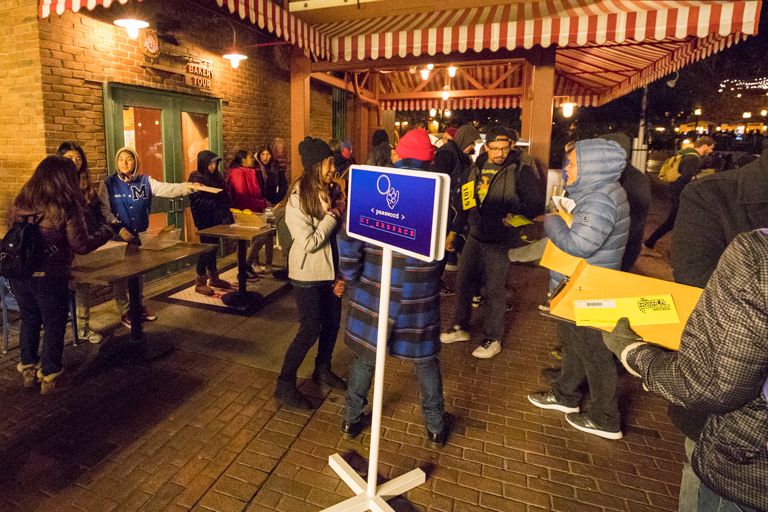 Starting from right to left, you had to identify Pixar characters on the signs based on their silhouettes. Some are easy enough, but you get the occasional minor character whose name escapes you. 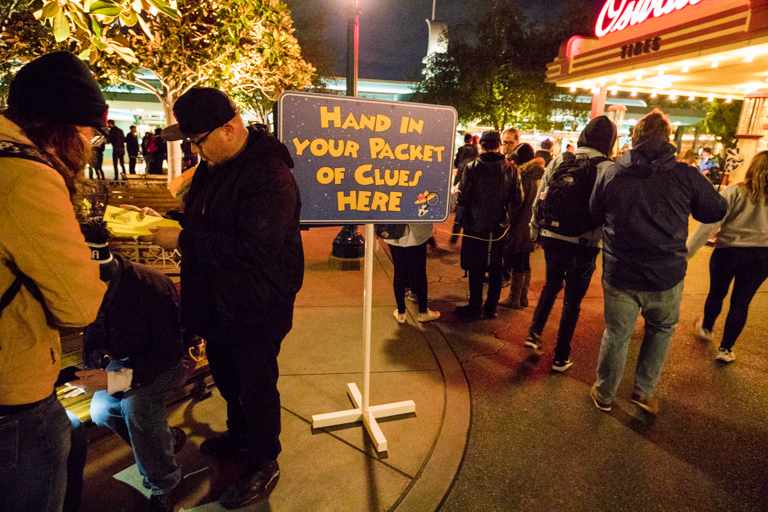 Normally the Clue Crew realizes that some places take way too long to walk to, so the Pixar Pier has typically been off-limits for clues. 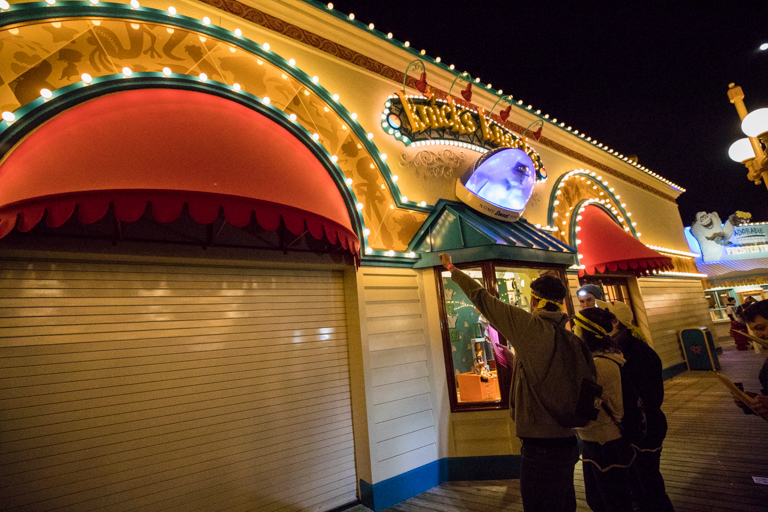 Tonight though since teams can plan their routes ahead of time, Pixar Pier is back in play. 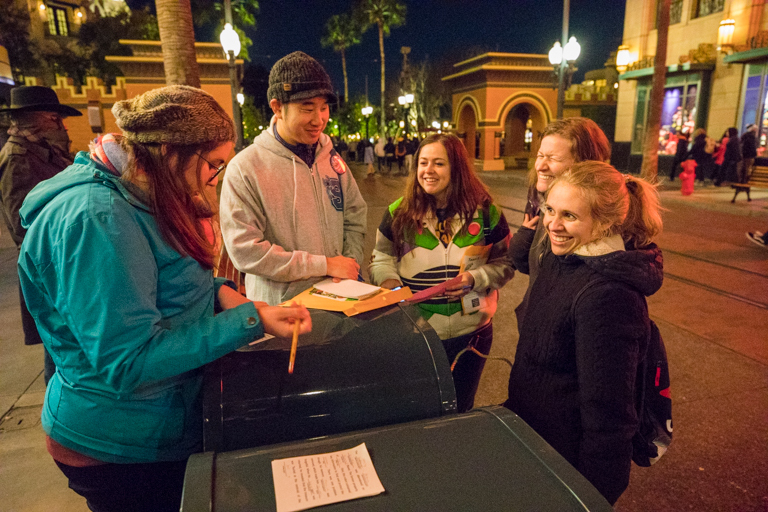 I caught up with members of the Disney Cast Choir as they were having their bake sale here. Normally during the race there's no time to stop and grab a snack. Tonight though I bought something and we chatted for a few minutes. It's a tough location back here. Even with the new format, not a lot of teams have made their way back here. 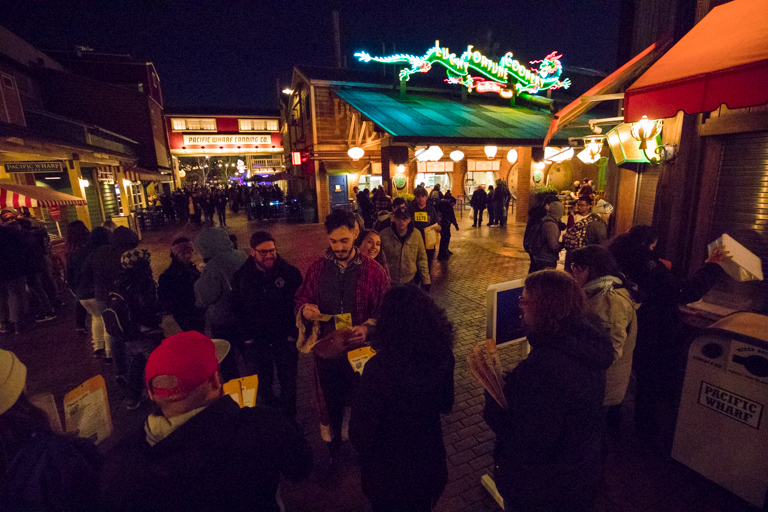 There's other fun clues that incorporate the games of the boardwalk. And as near as I could tell, this one required you to use your senses and figure out the texture of this goop in the bowl, and match it to the consistency of one of six different samples. 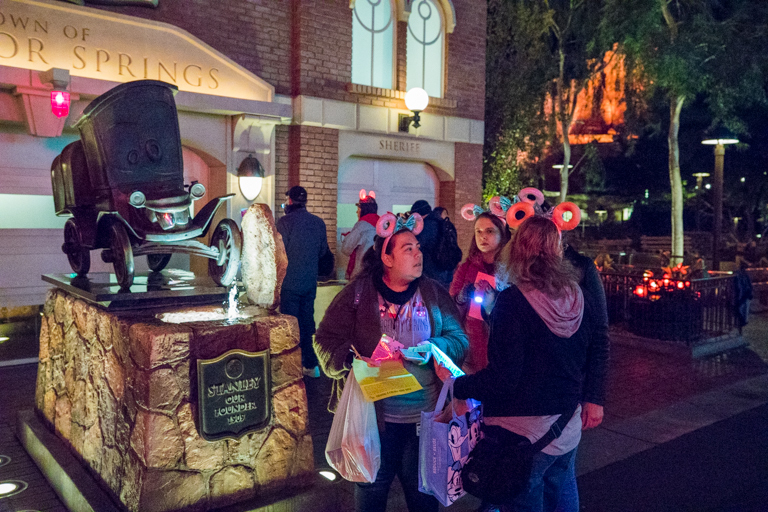 There's always something good going on in the World of Color viewing area. First, teams are singing "A Dream is a Wish Your Heart Makes." Attitudes matter! Act like you're having fun with it, get a "passing" sticker. Be a grump and not be nice, also get a sticker, but you don't realize you just failed. Also here, teams played a version of Kingdom Hearts, rolling a dice and moving their avatar around a board to make it to different zones. Each zones had trivia questions they were required to solve. Visit all the zones and answer all the trivia to complete the clue. 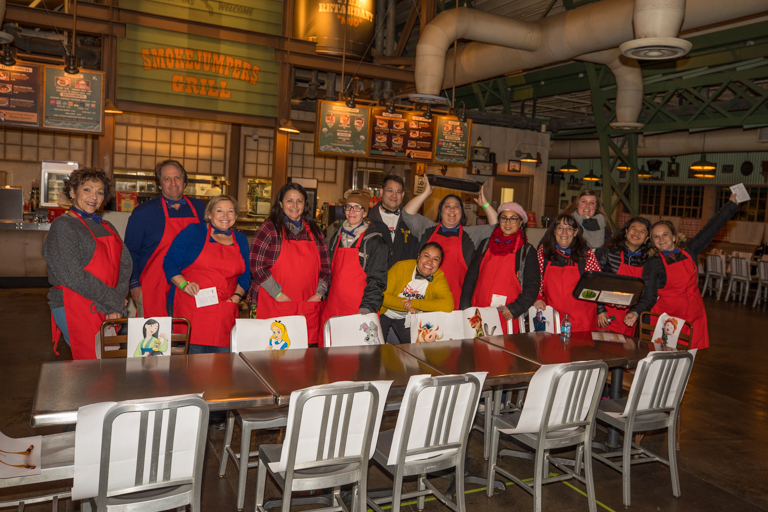 By the Little Mermaid teams received a clue that directed them to the Pacific Wharf where they would use items on the menus of various dining locations to solve the clue. 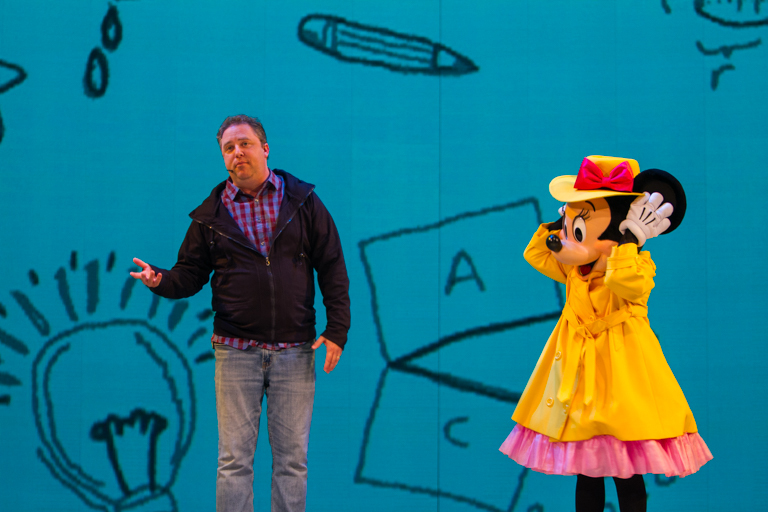 Throughout the night Detective Minnie made appearances. Fortunate people even got a special visit and got to take photos. 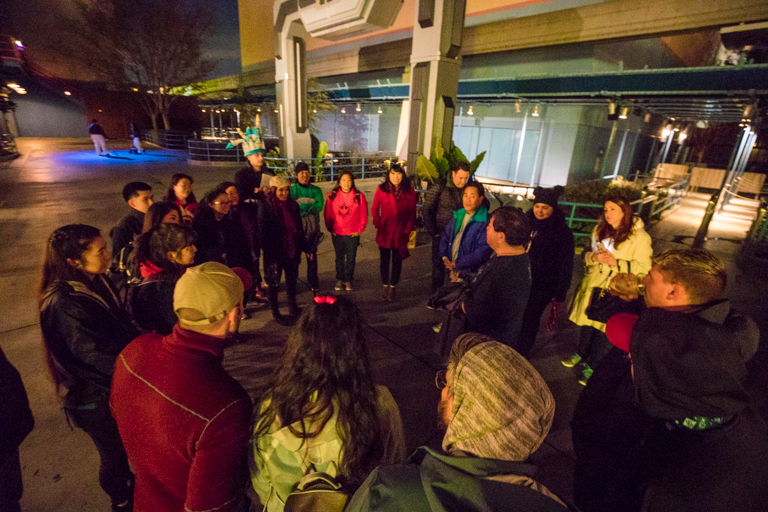 I was happy to see that the Cast Choir had a second busier location set up in front of Schmoozies. Let's go find Jacob. He's running a clue beside the Hyperion Theater. If you remember your Disney movies well, you'll recall that before the movie starts, a shot of the castle is seen. Often times, the image of the castle is customized to the movie. 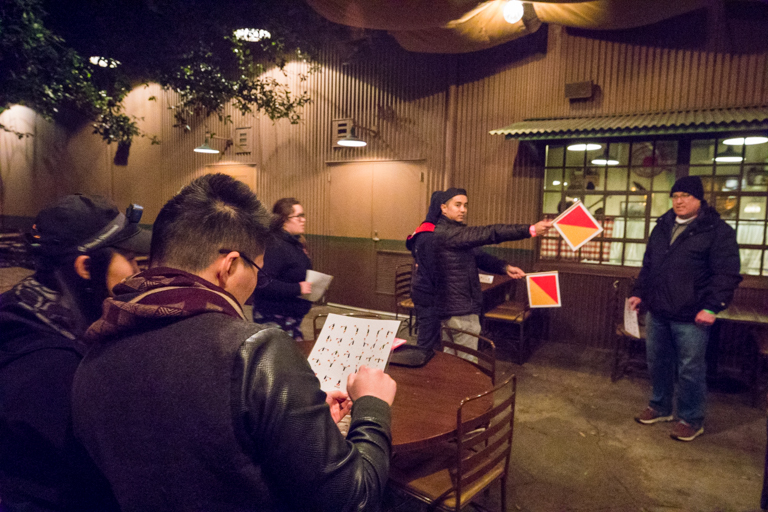 Teams had to identify the movies associated with 10 altered logos and put them in chronological order to spell a word that's associated with the castle. You can play a similar game here: Oh My Disney - Castle Quiz. Now Jacob's hat makes sense, right? This team is multitasking. 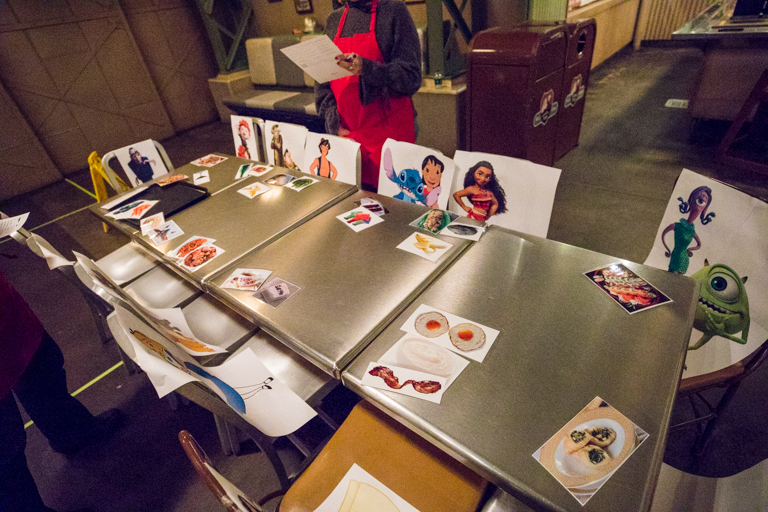 The first couple teammates are solving the castle clue, while the person in the back is still working on the Luigi clue from Cars Land. There's just so much detail at Disney for clue writers to use. Here they've made use of the luggage around Guardians. One thing that was sadly absent was a lot of fun team costumes. There were a few here and there, but I was hoping it would look like Halloween in here. 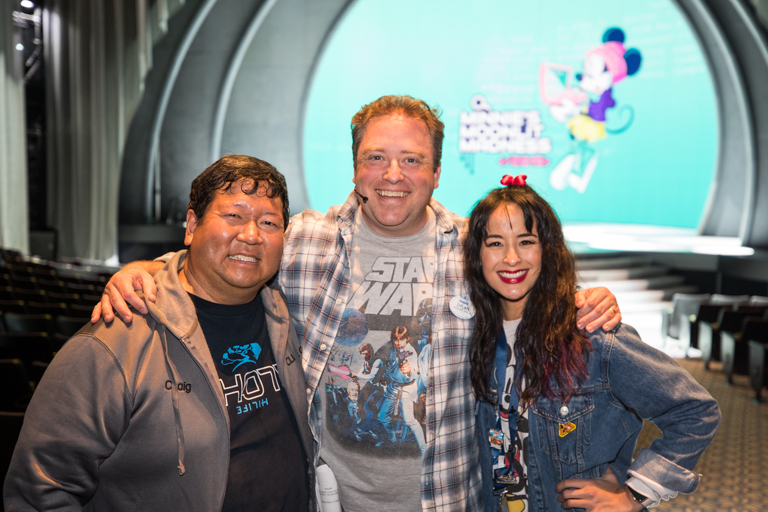 It's not often that you get a chance to dress up at Disneyland. I loved this team's recreation of the classic versions of Mickey Mouse. 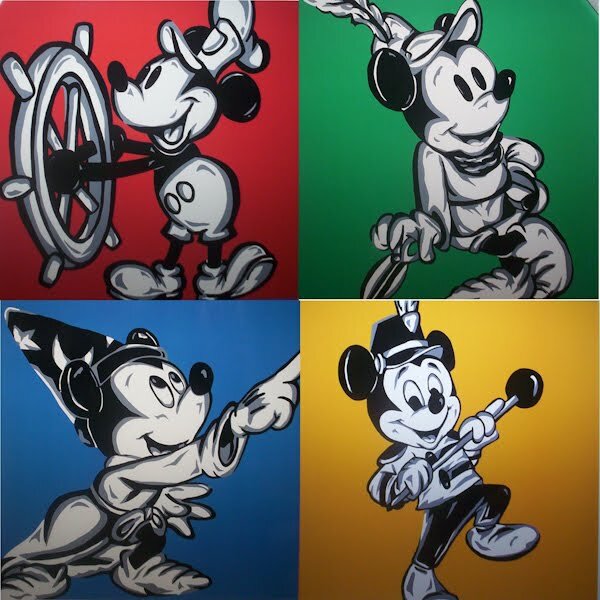 Bandleader Mickey, Sorcerer Mickey, Classic Mickey, and Steamboat Willie. It almost reminds me of this painting by Allison Lefcort. Just missing the Brave Little Tailor. 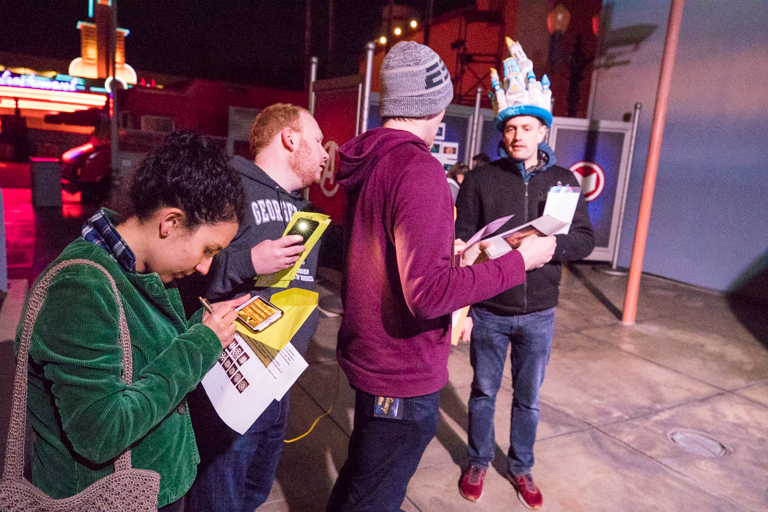 I was happy to see that Clue Crew member Thomas hasn't forgotten about the former Muppets attraction here. 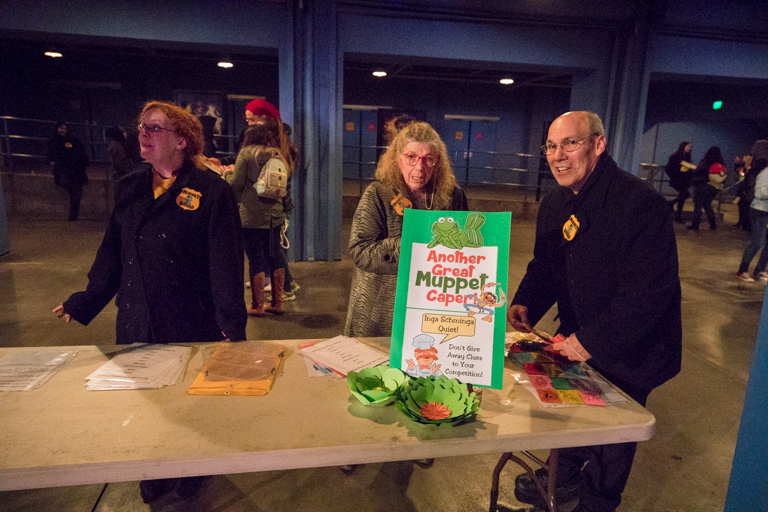 Teams found different agents of the Muppet Squad and had to identify different Muppet characters based on various descriptions and would receive a card with that character on it. Once they visited all the agents, they arranged them and solved a puzzle. At the end of the night once the hunt was over, teams made their way to the front of the park. Here they turned in all 10 of their clue envelopes and their rope and called it a night. Whew! What an adventure. 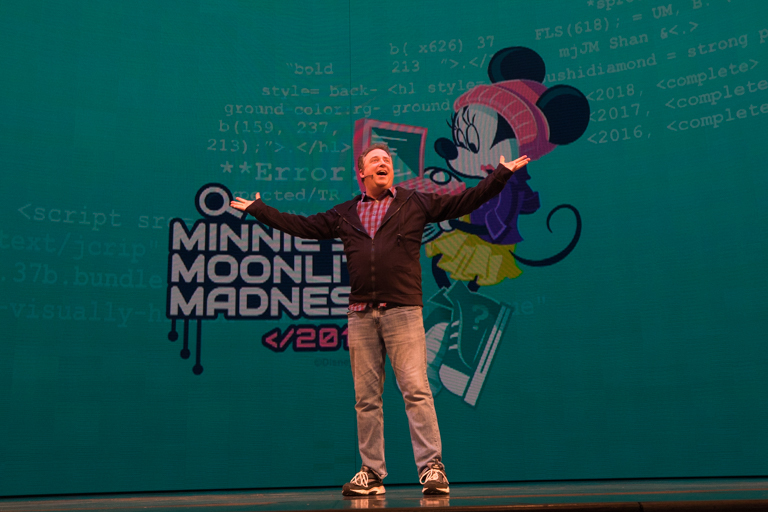 Minnie's Moonlit Madness is certainly a lot of work to put on, but it's an amazing experience. I'm very thankful that I've been able to be a part of it all these years, and even though I'm not always able to participate, have been invited back as a volunteer. Thank you to everyone involved!